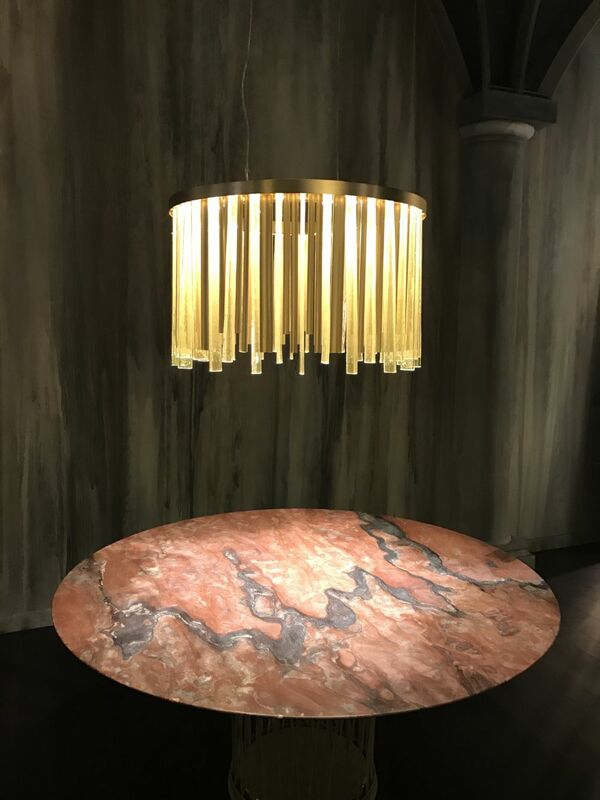 Whether your interest is luxury lighting, classic furniture or the newest contemporary designs, Milan was the place to be last week for the annual Salone del Mobile. 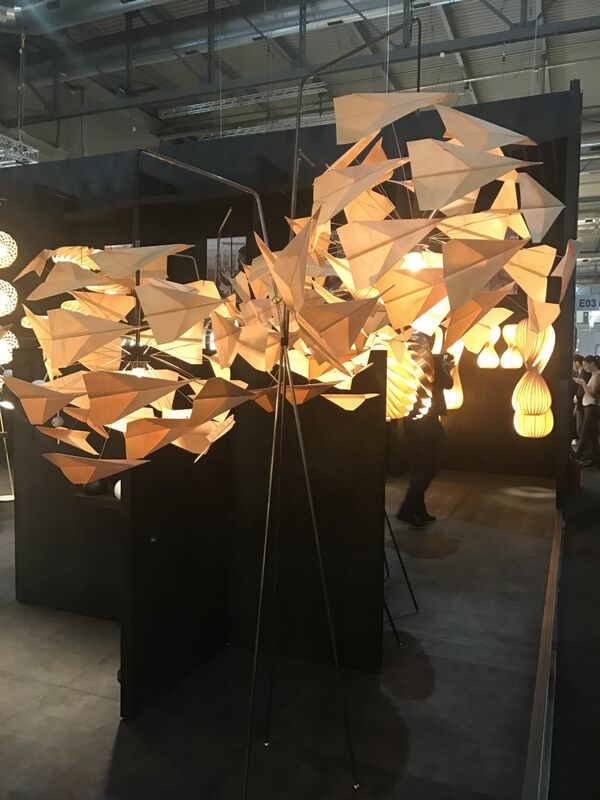 The global mecca of furniture, lighting and all things design was focused on “Euroluce,” this year, which presented the latest in lighting fixtures and innovations from classical to modern and minimalist. 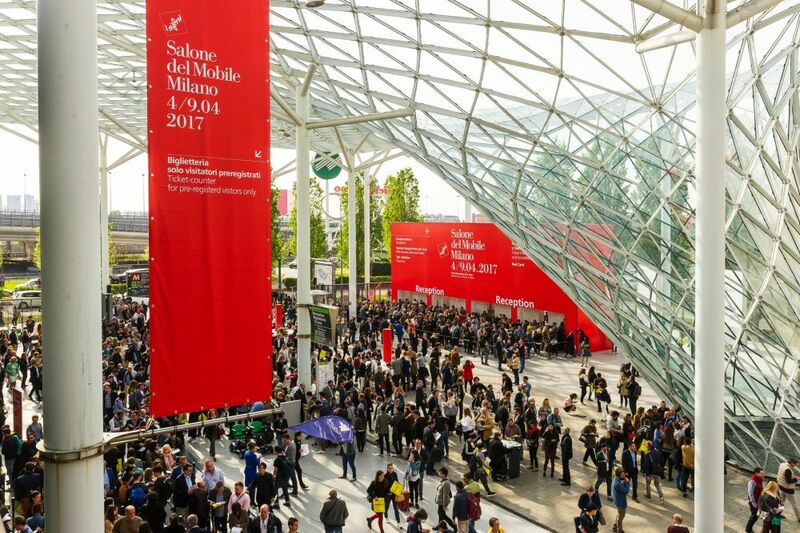 Salone del Mobile.Milano is closed with 343.602 attendees in 6 days from 165 countries. 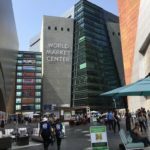 The fair, which attracted more then in 6 days from 165 countries, also showed the latest innovations for melding work and life environments for the best productivity and happiness in Workspace 3.0. 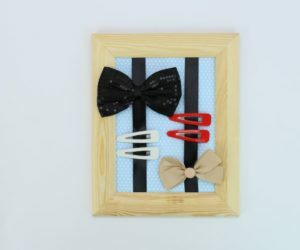 Called A Joyful Sense at Work, the section featured functional pieces for work that make life easier along the blurred line that divides today’s work and personal life. Almost as important as what you serve for your Easter dinner is how you decorate the table. 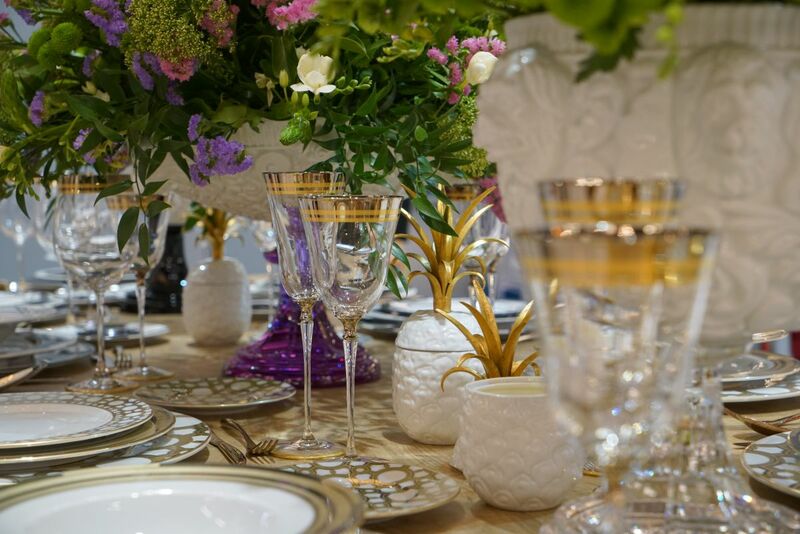 Entertaining family and friends at this festive time of year is one of the best parts of the holiday and Salone Del Mobile had some great ideas for spring decorations to inspire you. 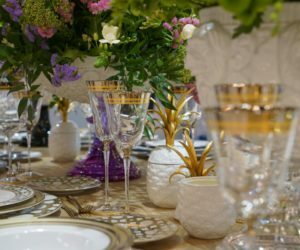 Use flowers, accessories and your best tableware to create a tablescape that welcomes your guests and highlight the best of springtime. 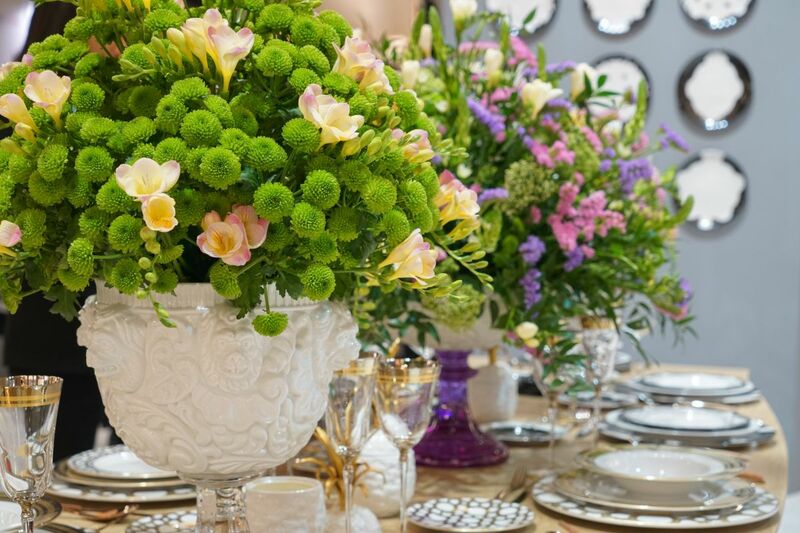 Choose a profusion of flowers that emphasizes the green of the new seasin. 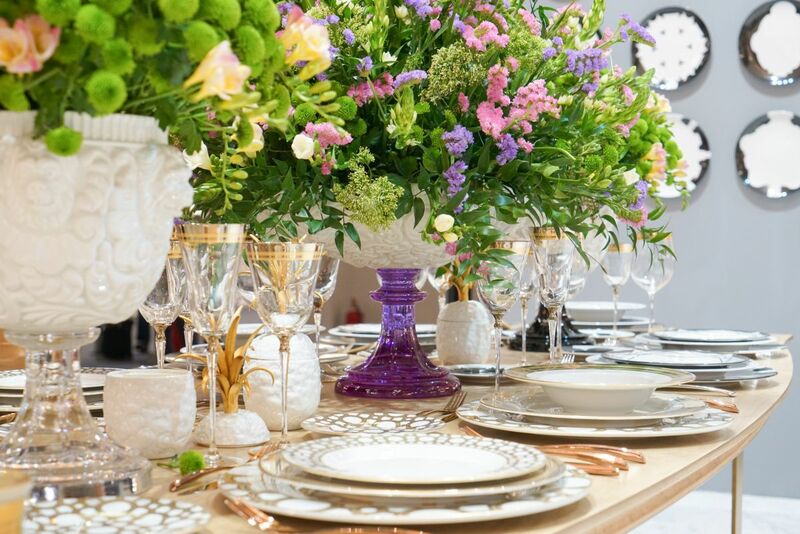 With a white dinnerware palette, try to add some extra color with accessories and vases. 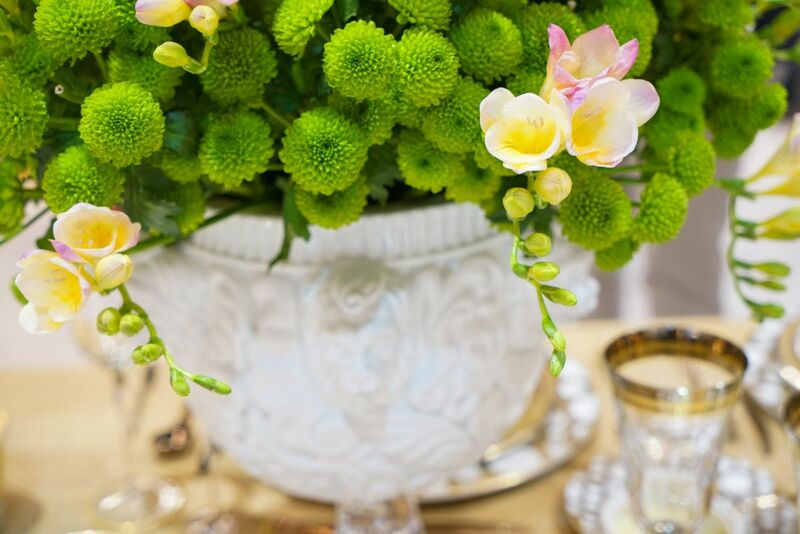 Skip the expensive blooms and use pleny of flowers and leaves in shades of greens to signal the arrival of spring. Easter is a great time to break out your best china. These glasses and acessories have accents of gold. 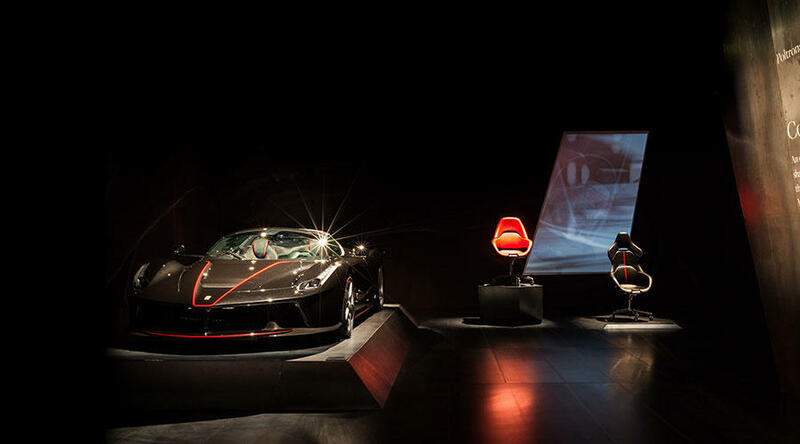 participation in Salone was a team effort with Ferarri this year. It focused on a project by Michele De Lucchi, which was a huge, almost endless telescope symbolizing Poltrona Frau’s continuous drive forward. 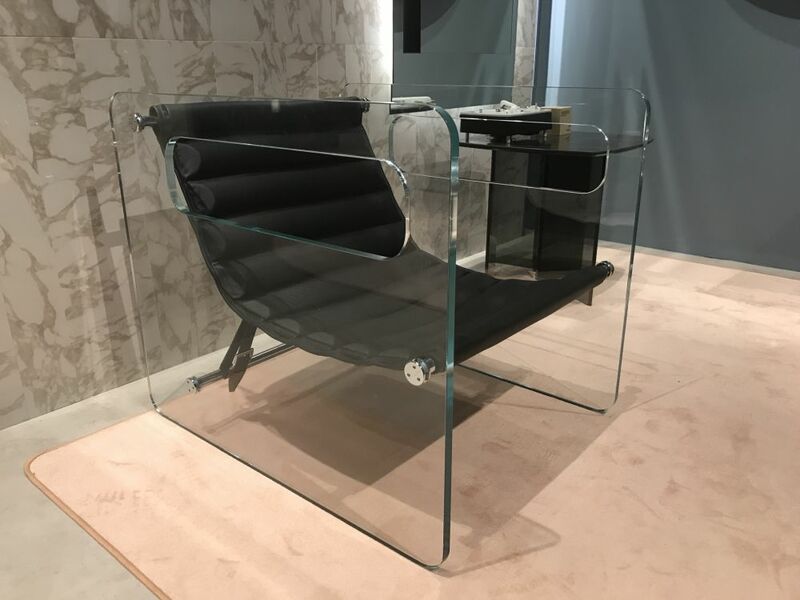 The company’s installation was an expression of Leathership, its hallmark leather work and included executive desks clad in leather, sofas and a variety of chairs in various shade of leather. 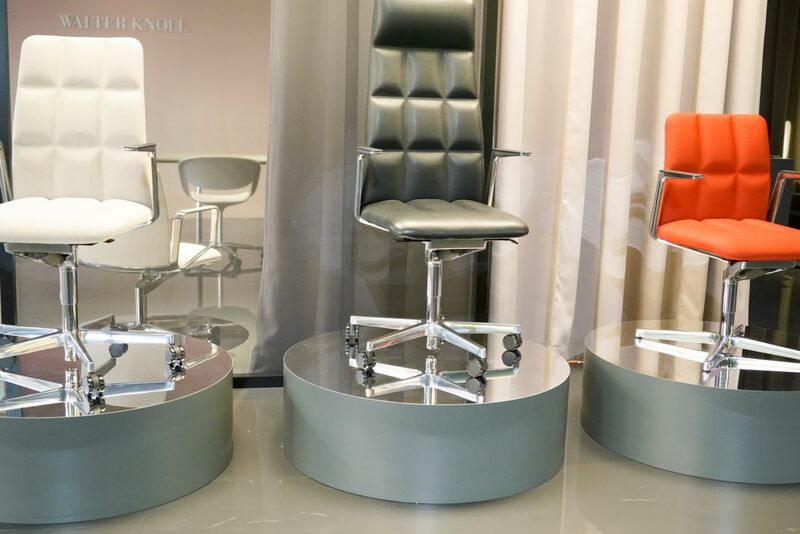 These are the first office chairs in the collection. 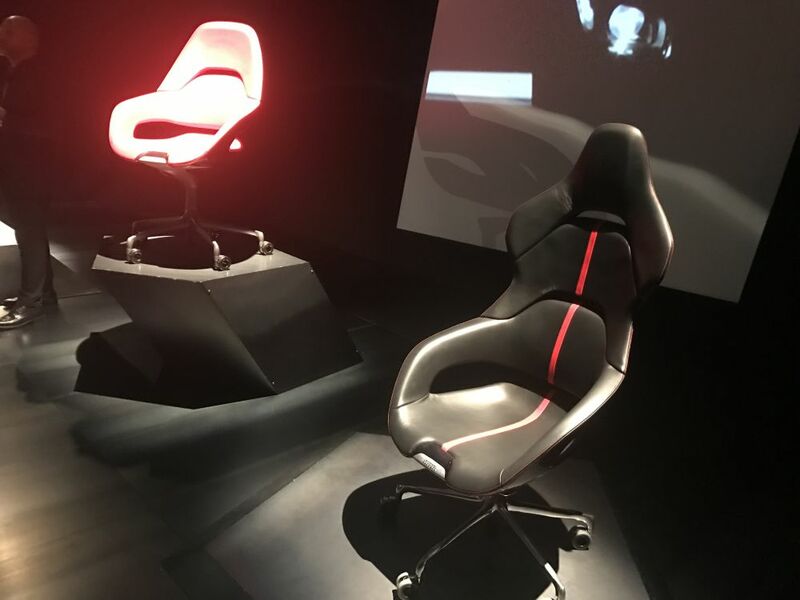 The link between the leather in the cars and those on the chairs is apparent when displayed together. 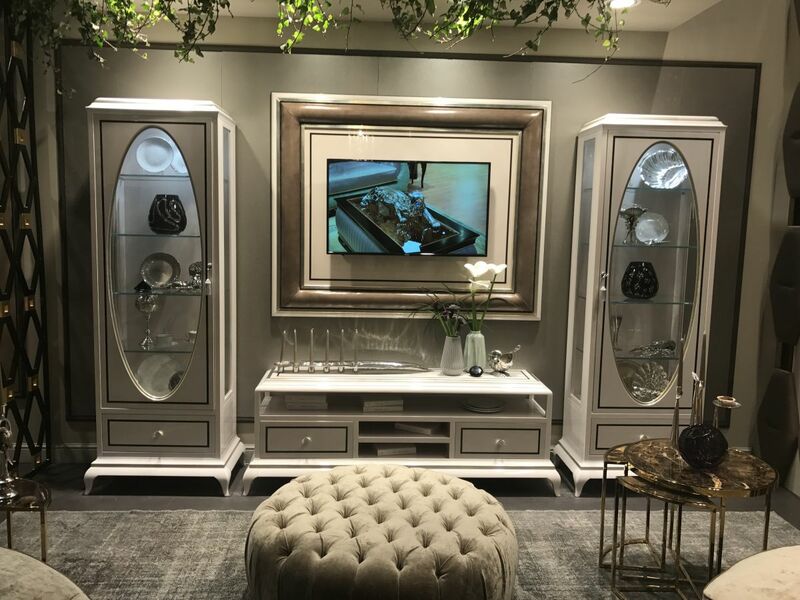 The display focuses on bringing Poltrona Frau style into every part of the home. The iconic Cockpit seats are like sculptures. 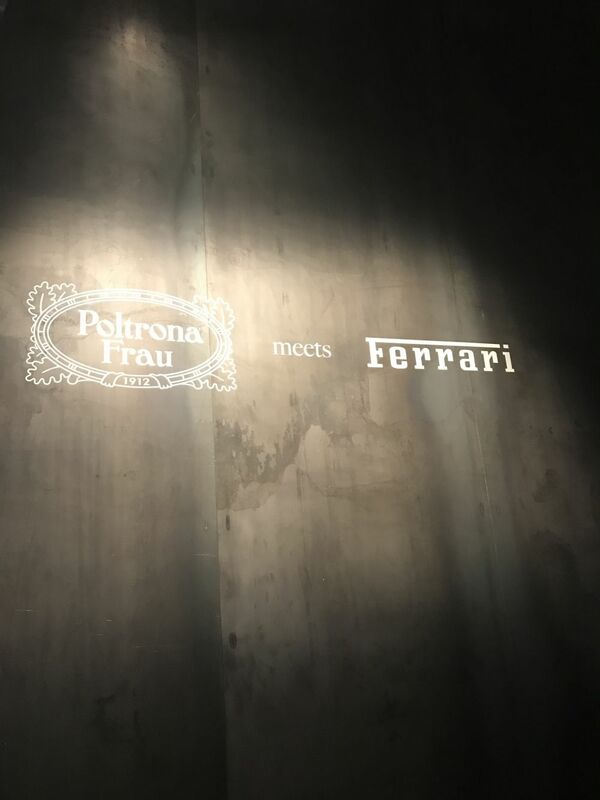 This is a project by the Ferrari Design Centre, developed and created by Poltrona Frau. 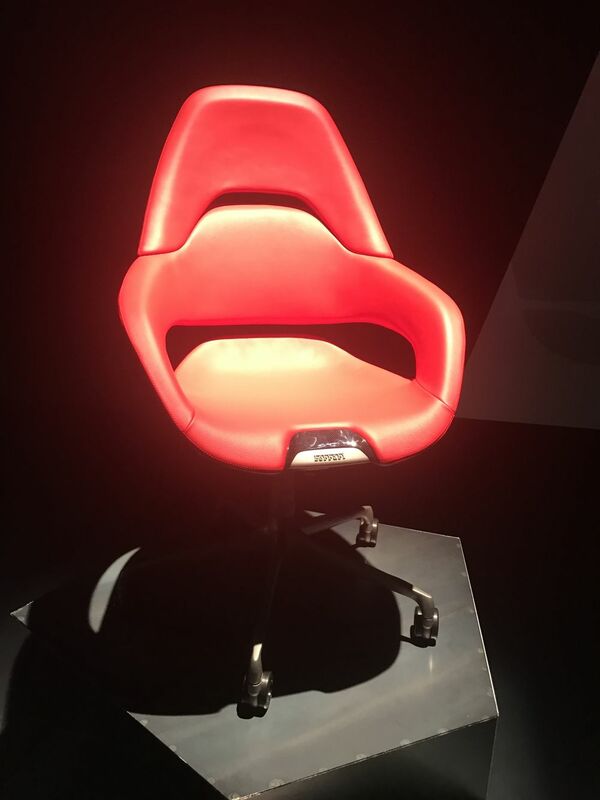 This office chair is upholstered in Ferarri’s classic red. The new designs are also available in a neutral shade. The black chair sports a chic shape and an of-the-moment red stripe. 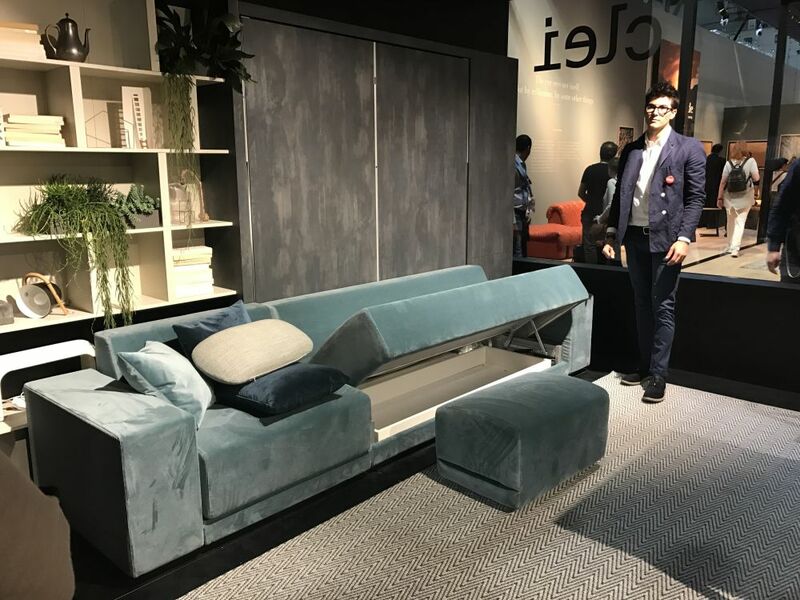 space-saving, modern designs have long been a favorite and their display at Salone featured solutions for many rooms of the home. 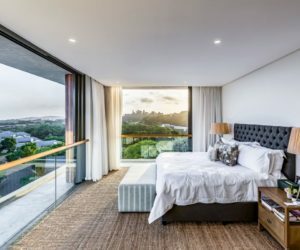 The designs are perfect whether you need to make the most of a small space or you just want to make room in a larger home more multifunctional. 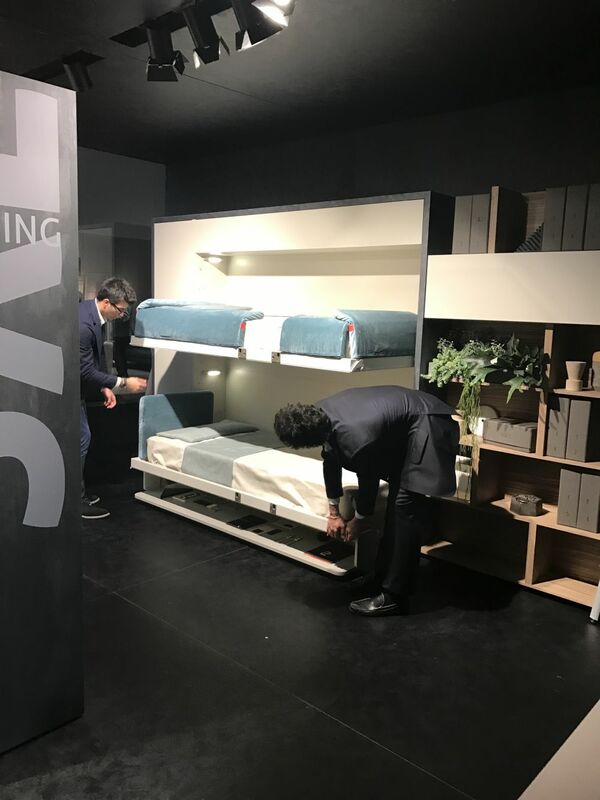 The innovative Italian company was established in established in 1962 and has specialized in transformable systems for homes, vacation houses and business residences for more than half a decade. This lovely blue sofa is stylish in its own right. With great ease, it’s possible to turn the sofa into a comfortable bed for two. 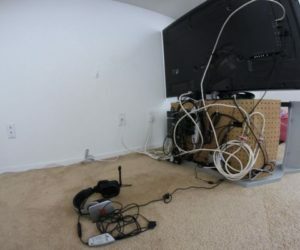 Unlike sofa beds of yore, the Clei system doesn’t require taking the entire sofa apart. For a child’s room, a bunk bed system leave more room for play. 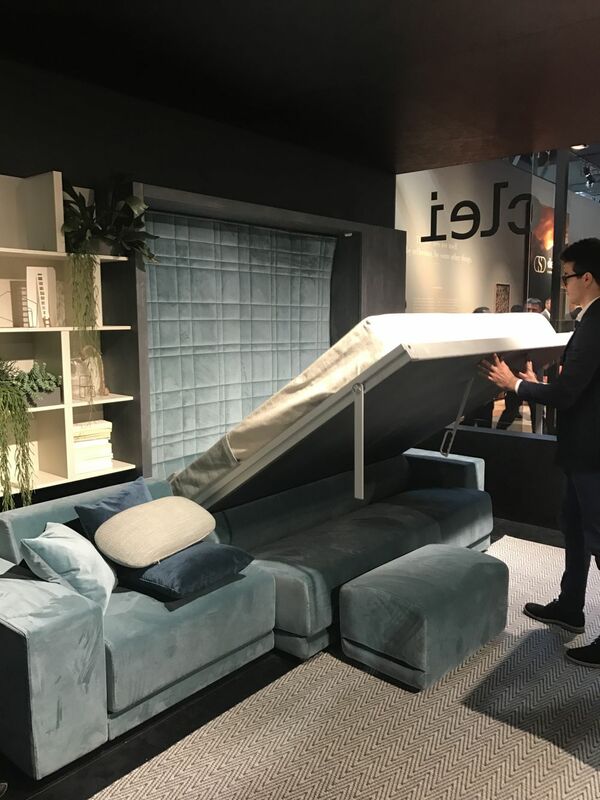 This year, Clei debuted “Habitat in Motion,” a movable wall that can transform a single room into a space with multiple uses. Make a functional change whenever you need to by adapting for dining, working, sleeping or just lounging. 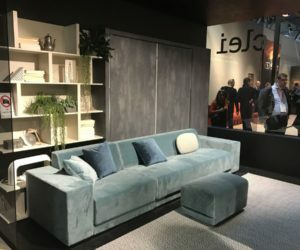 The large central element slides along a single rail, allowing you to make your space a living and dining room with a sofa, TV and table, a workspace complete with large desk and a modular bookcase, or a sleeping area with a double bed, two bunk beds, storage compartments, bookcase and drawers. This is the easiest way to make the most of a small space, or even a larger single space. Simple, natural materials are transformed into stylish, hand-crafted furniture by the artisans of . 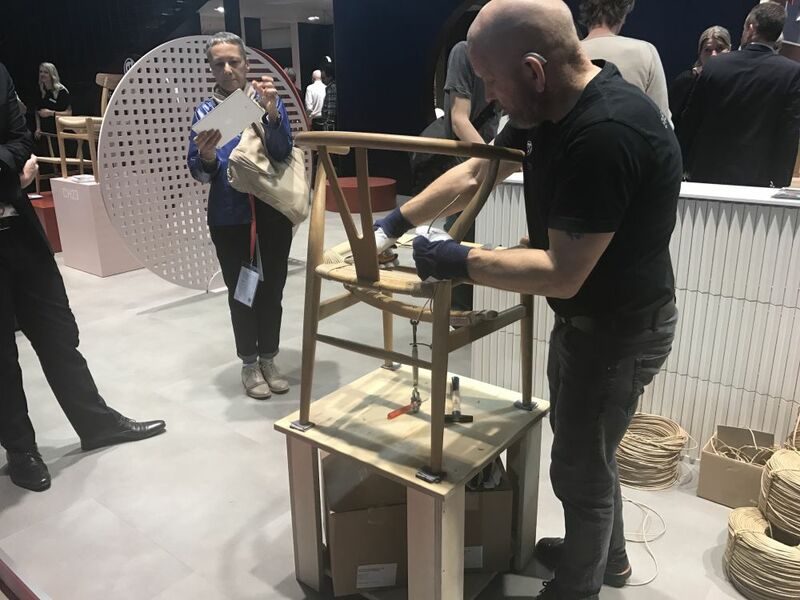 For more than a century, the Danish company has focused on high-quality, lasting pieces that are manufactured with traditional techniques and the latest technology. Most Carl Hansen’s designs were created by top Danish architects in the 1930s and up to the 1960s. 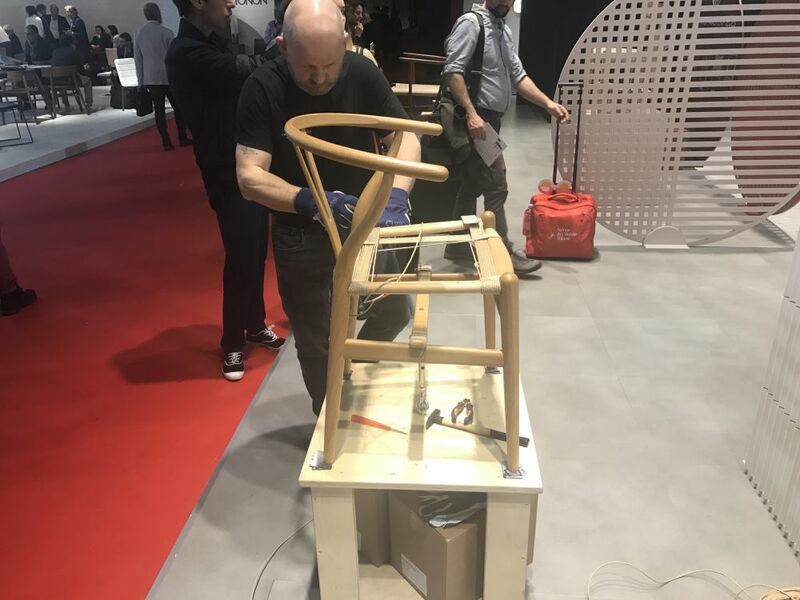 In their Salone booth, a craftsman demonstrated the production of the Wishbone Chair. This chair was one of the very first models Hans Wegner designed just for Carl Hansen & Søn. The piece has been in continuous production since 1950. Here, the seat is being woven. Simplicity of design, quality of materials and expert workmanship produce chairs that will be family heirlooms. 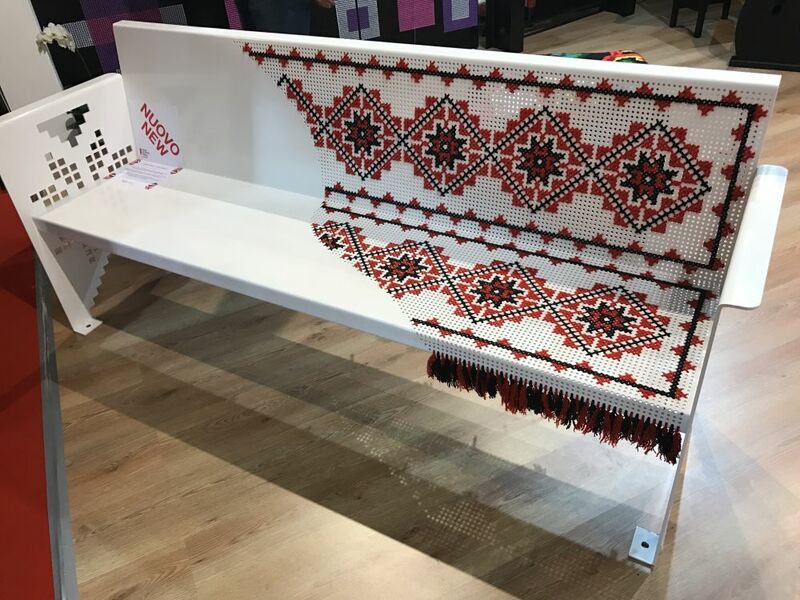 A metal bench from of Romania sports a hand-sewn design in a traditional pattern from Moldavia, a region in the north region of the country. 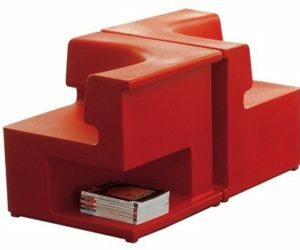 The customizable bench can be used indoors or out, and is suitable for a home, restaurant, office or other public space. 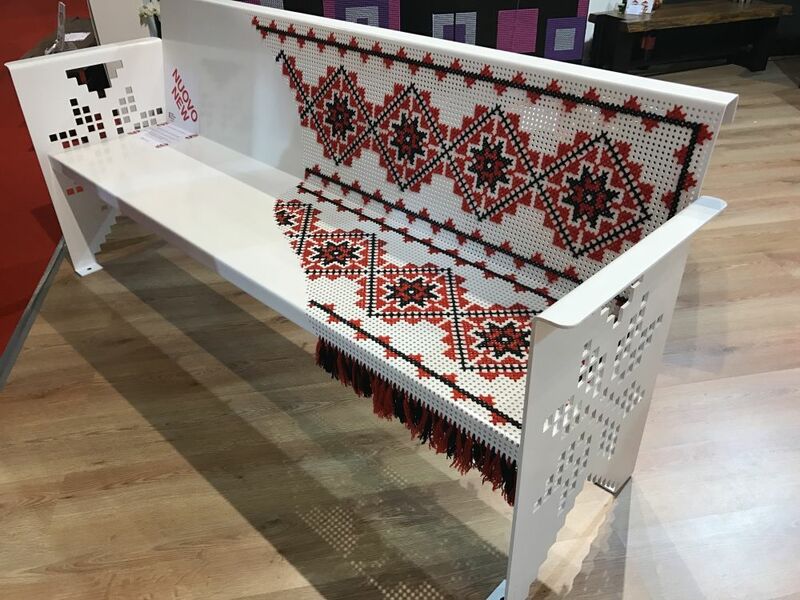 The bench is made from perforated sheet metal and measures 190 x 80 x 60 cm. The design in the arms mimics the ebroidered section of the bench. 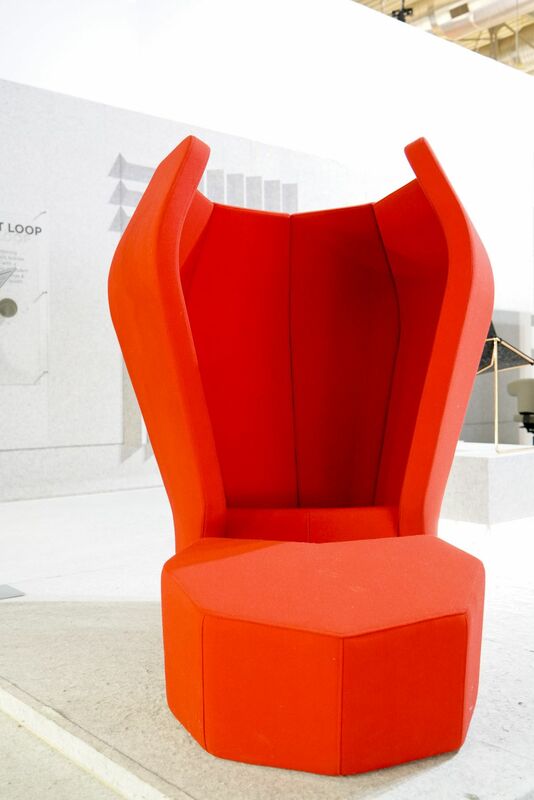 The Naked chair by is a handmade modular Italian armchair. The channeled leather sling seat is supported by a modern glass frame. 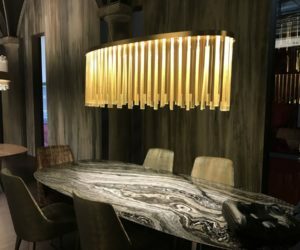 The company, known as “a fashion house for all living spaces,” highlights classic and modern luxury Italian furniture and lighting design. Naked is also available in other glass colors. 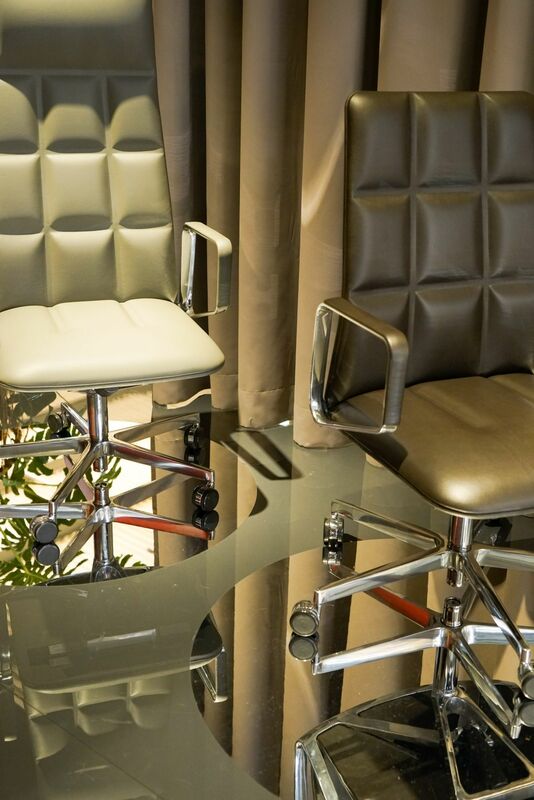 The Italian-made chair is avilable in black leather or white leather. Designed by Doshi Levien for Kettal, this is the . The high-backed outdoor armchair dominates a space yet has a light and airy presence. Woven rope construction provides privacy but still allows you to connect to your environment. Cala is designed as a dining chair, or a lounge chair. For 50 years, Kettal has been producing innovative designs and today, works with some of the top people in international design. 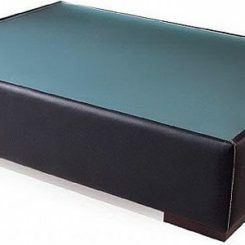 A wide selection of metal coatings, rope colors and cushion fabrics is offered. We like Kettal’s club chair, because it really doesn’t look like the typical outdoor chair. 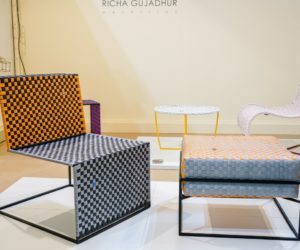 The backrest is actually two separate pieces connected by colorful straps, which are connected to the main aluminum structure with two pins that can easily be removed. 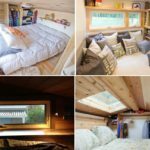 This allows you to remve the cushions for storage. A semi-transparent micro fabric supports the seat cushion. 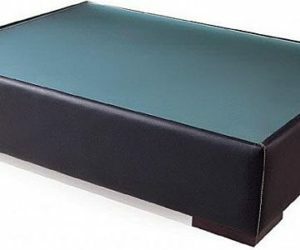 The aluminum frame, straps and cushions come in many color choices. 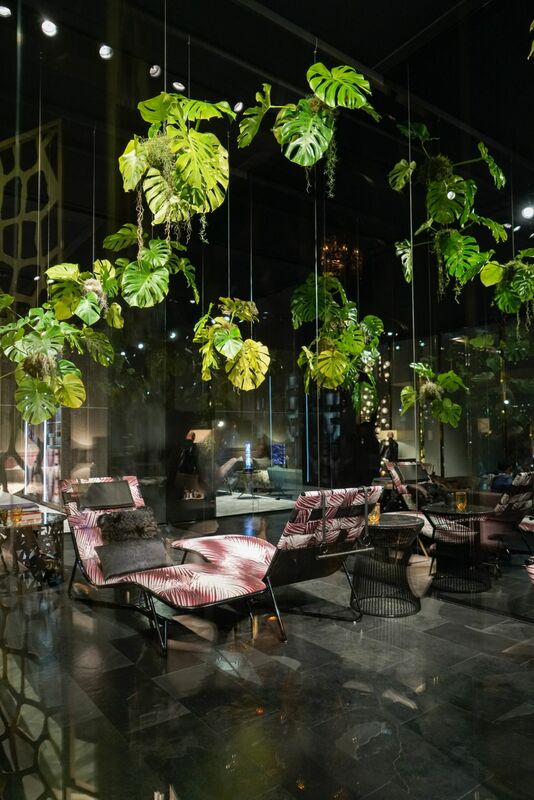 Moroso may be more than half a century old, but its designs are among the most innovative. The family-run company works with some of the world’s top designers and combines “craftsmanship and tailoring with industrial processing techniques” to create new designs. 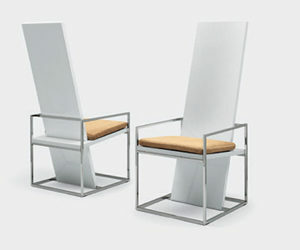 These small armchairs, the and , are by designer Edward Van Vliet. 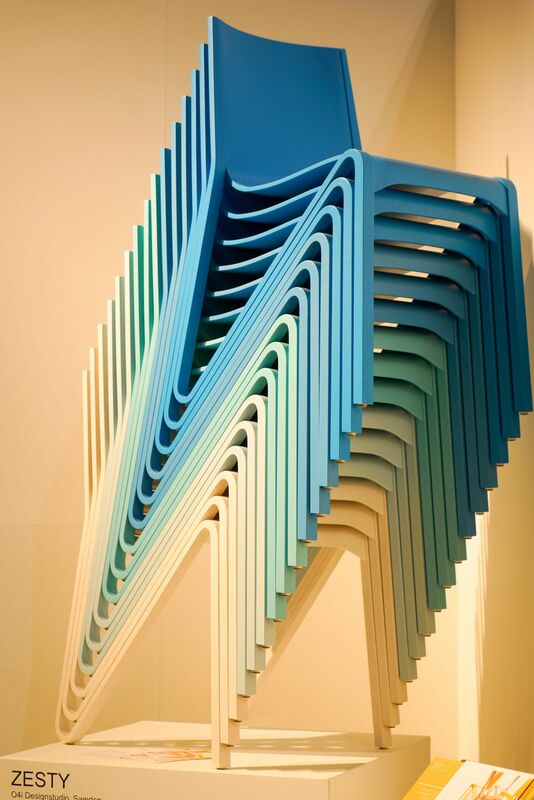 They come from the Sushi series, which is a playful line of seating for lounge areas. The shell is made from injected flame-retardant polyurethane foam over an internal steel frame. 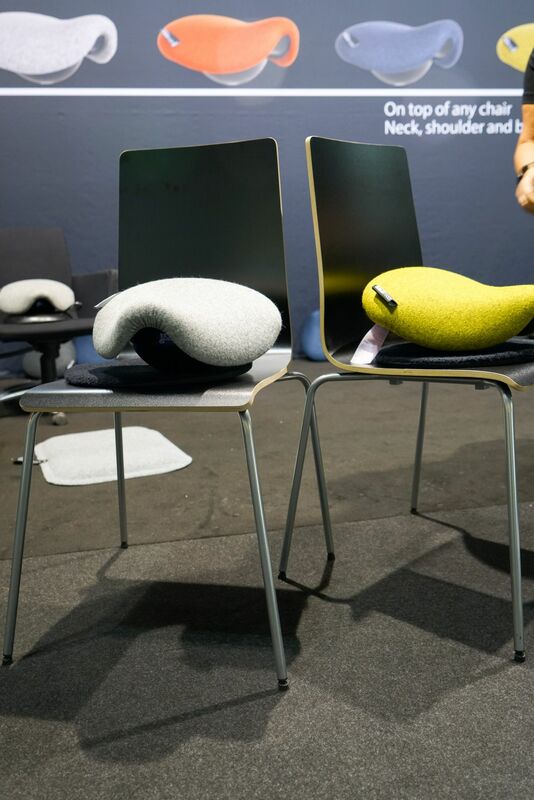 Seat cushions are filled with polyurethane foam and polyester fiber, while the back cushions are made with goose down. We just love the floral motif on the seat cushion. The base of each chair is varnished ash. 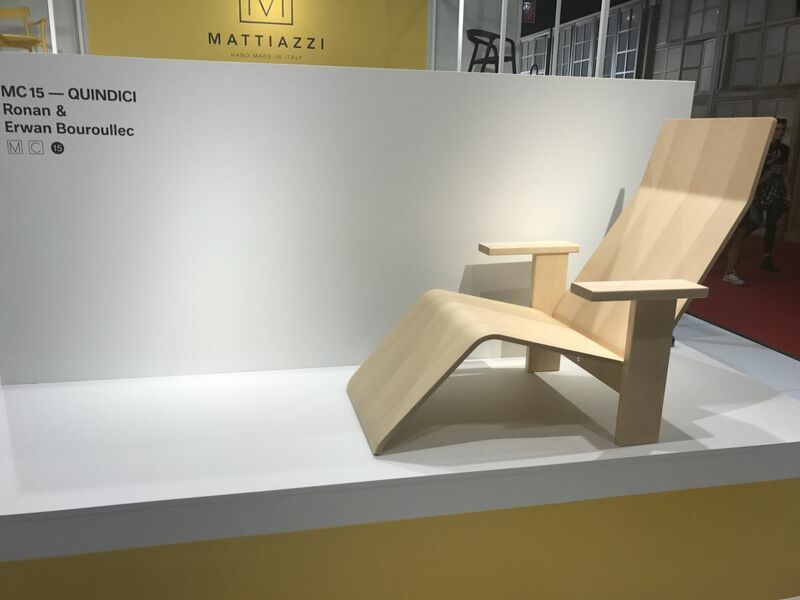 Milan’s MDF Italia designs and builds furniture, such as this Sign Matt chair. Designed by , the original Sign had a classic glossy finish and now is available in a matte finish. 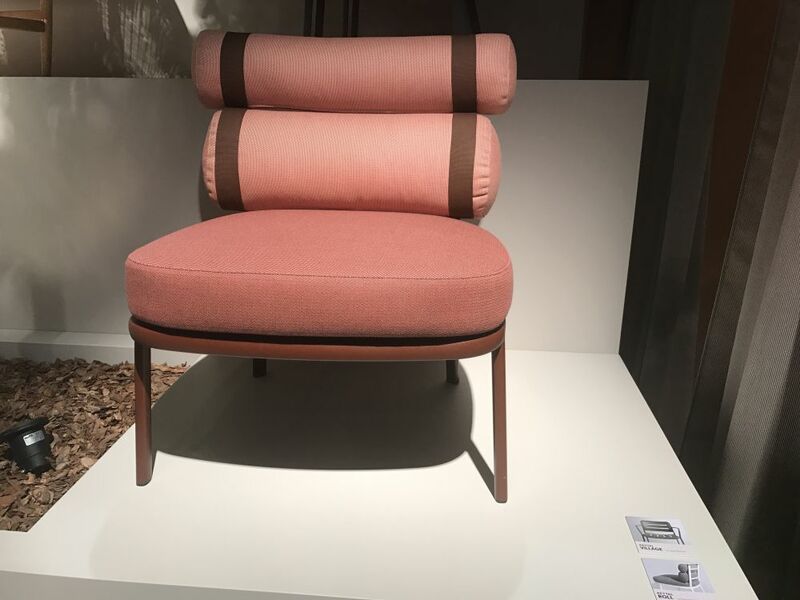 The new material and an updated color palette are featured on this indoor and outdoor chair. 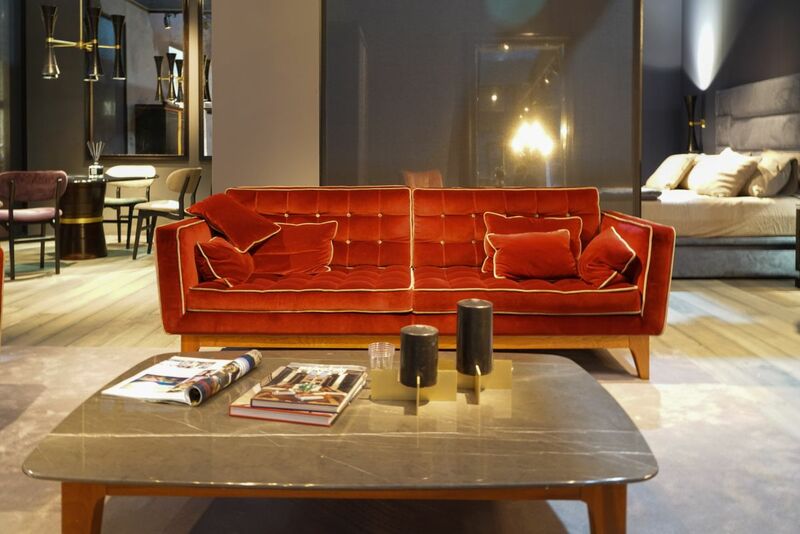 MDF Italia was acquired in 2013 by the Cassina holding group. 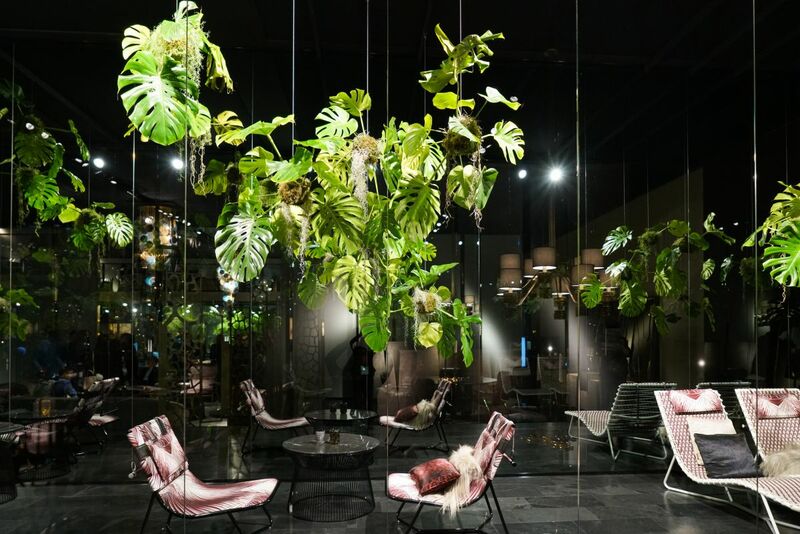 As comfortable as it looks, for Sancal of Spain was designed by Sweden’s Note Studio. Originally designed for a lobby, the shape offers seating for several groups but still provides some privacy. 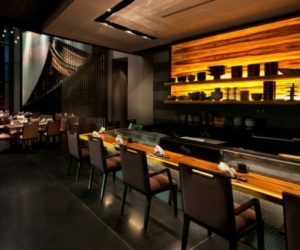 It would also per perfect for fostering intimate conversations in an entertaining space. The Isla is available in three different sizes and a selection of fabrics. Known for inventing woven vinyl flooring, is now expanding into furniture. 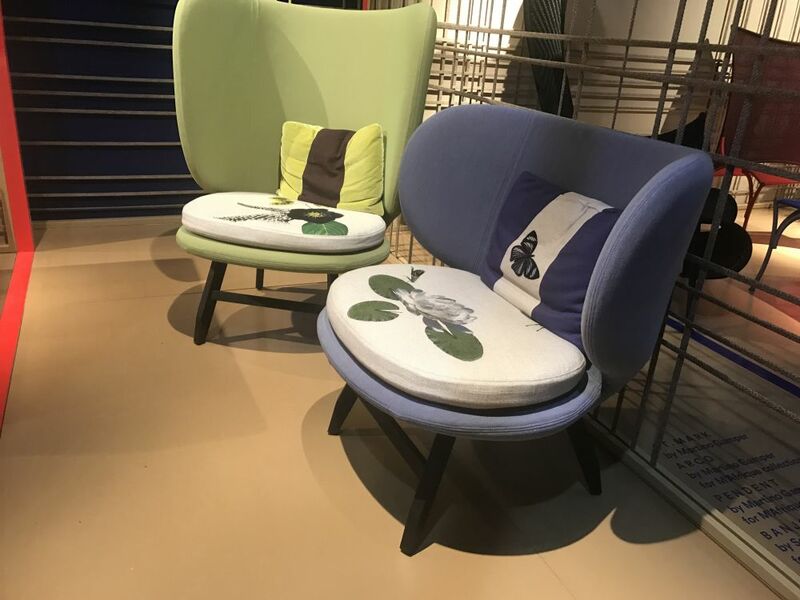 Collaborating with Nordic and European design houses, the company’s material is being used as upholstery. 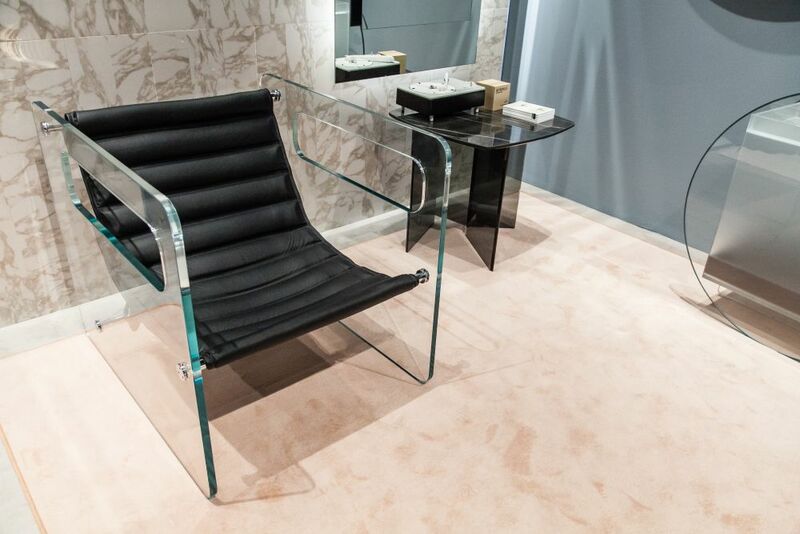 Doshi Levien reinterpreted its Paper Planes chair in Duet, while Thonet’s 209 Chair was reclad in Villa La Madonna. 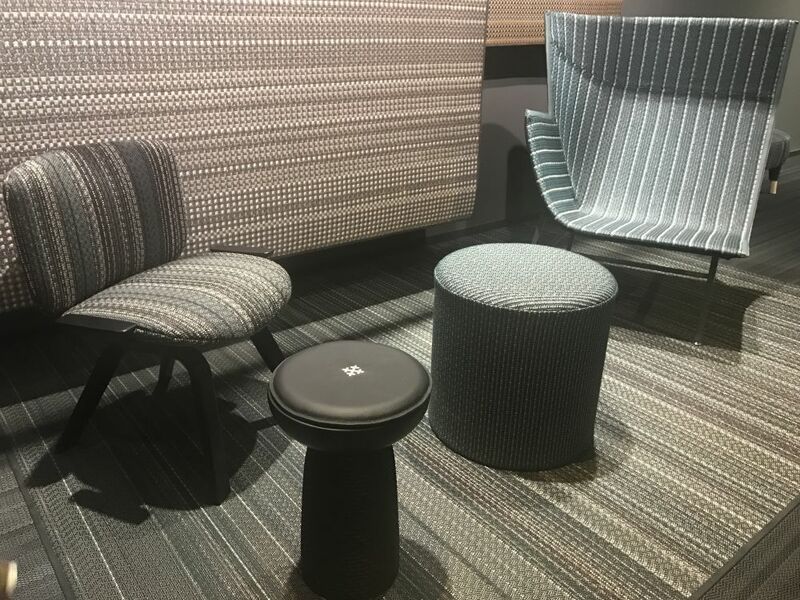 BD Barcelona’s Couture armchairs are covered in Bolon materials, and Gärsnäs’ used Duet for its Jack and Elsa stools. 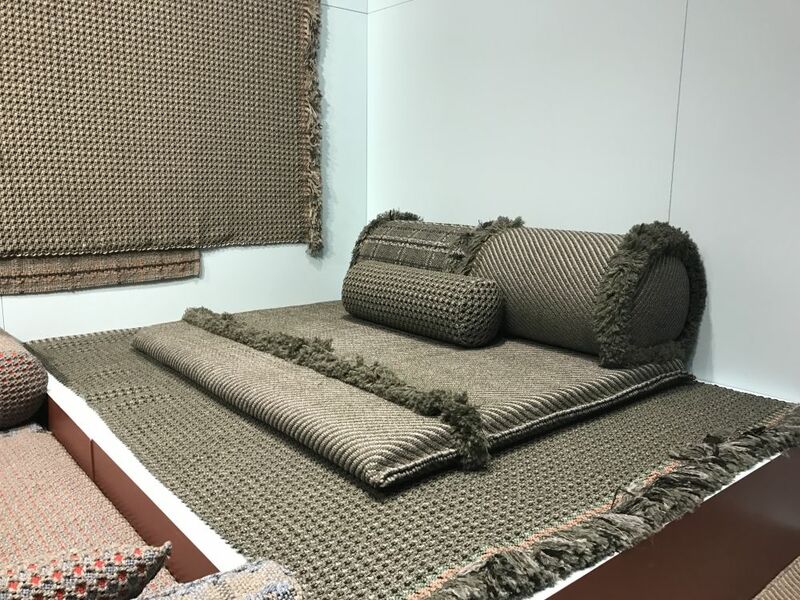 Using Bolon materials gives furniture extra durability. These natural and neutral rugs are from , the indoor brand of GANDIABLASCO. 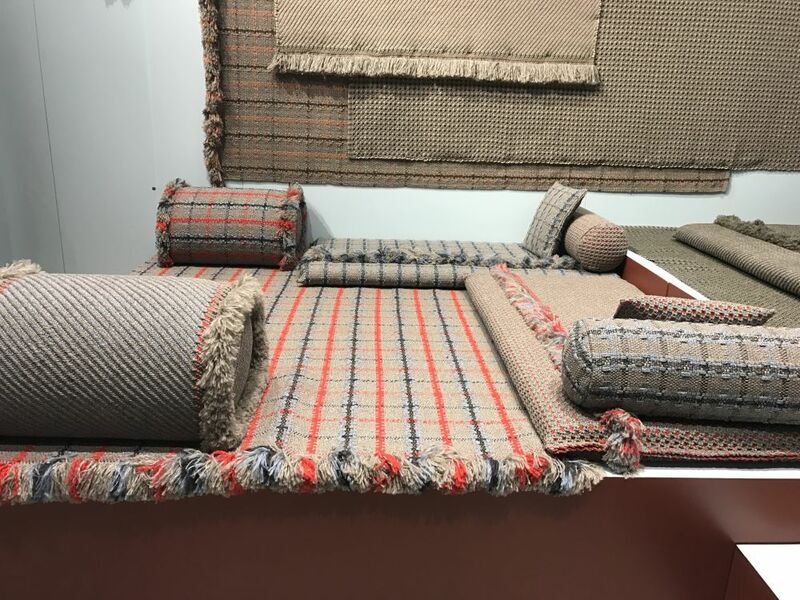 Company president José Gandia-Blasco reinvented his family’s business and developed new lines of home textiles, particularly rugs. These GAN rugs are the Garden Layers collection and were designed by Patricia Urquiola who was inspired by the delicacy and harmony of Mongol architecture. They are made by hand in India by experienced craftsmen using natural fibers like cotton, linen, jute, silk, and wool. A neutral palette is punctuated by bold stripes. Nubby textures and natural materials combine well with existing furnishings. 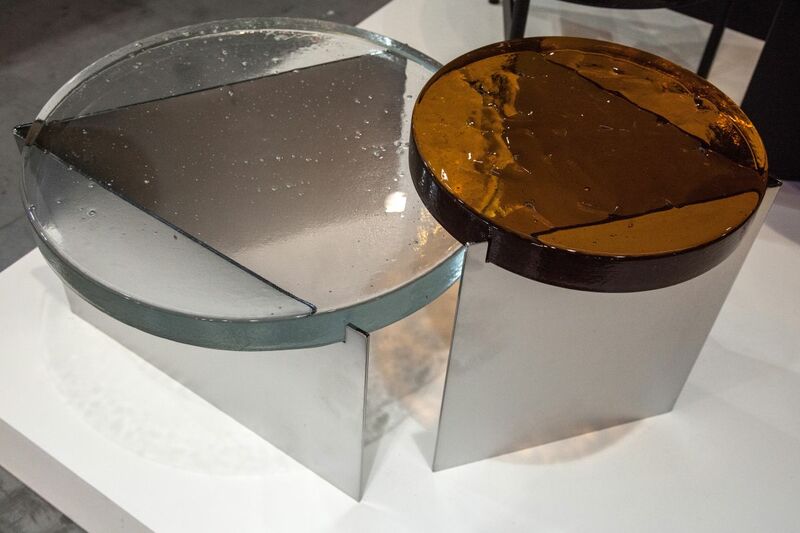 The gives classic furniture pieces a seriously avant-garde design twist. 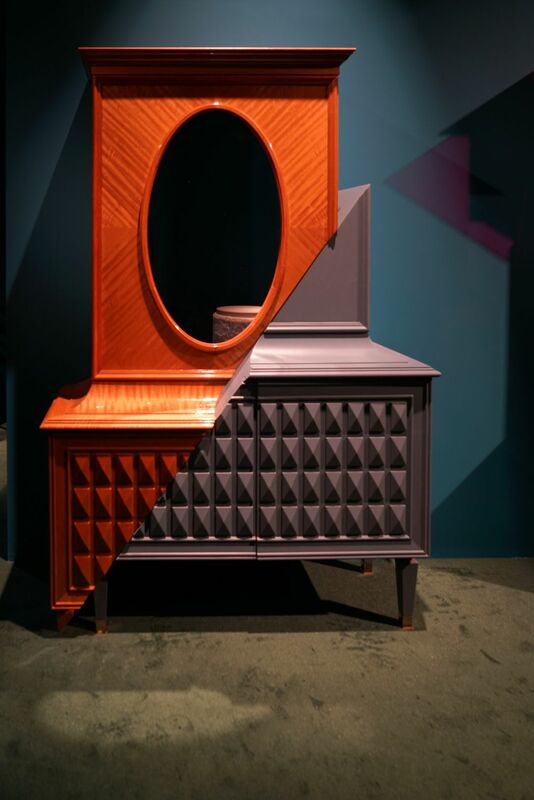 The oddly conjoined pieces are the work of Italian design artistic director Ferruccio Laviani. 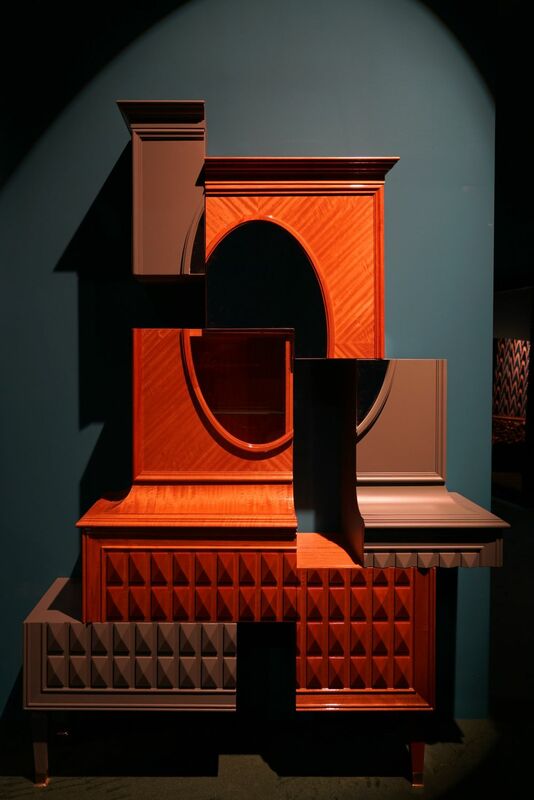 The series of three cabinets look as if someone sliced off a section of the piece, reconfigured it, and glued it back on. The shift in perspective and deconstructed look are highly attractive and intriguing. 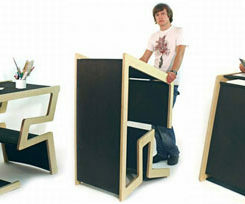 Two colors and longer legs on one side give the cabinet a split personality. Is it splitting apart of pulling together? The separated segments make it difficult to tell. 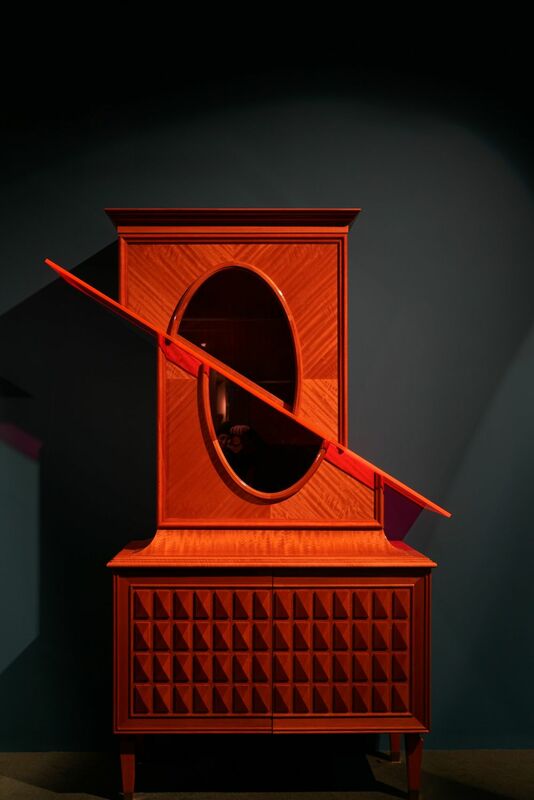 Bisected by an angled plane, the cabinet top looks as if it is sliding sideways. Glass-topped tables are nothing new but tables made entirely out of Murano glass are extra special. 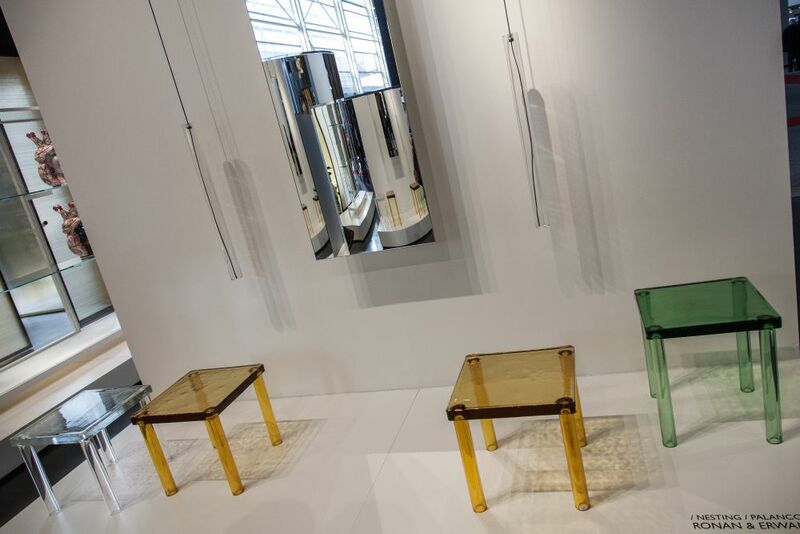 These occasional tables by GlasItalia are part of the series by and are crafted by the master artisans from Murano. In addition to the clear version, the colored options are made of only glass — a combination of a poured top and blown legs. It is the legs that make these tables stand out because it’s not common to find the legs also made out of glass. These small tables are a great way to add a pop of color but their transparency helps keep the mood and the design feel light. The Nesting tables are design-forward, but also very functional. 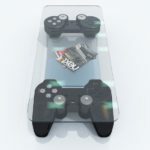 Another set of glass tables but with a completely different look are these offered by . Rather than flawless clarity, these glass rounds feature natural bubbles that occur in the casting process and add to the character of the piece. 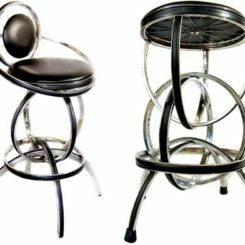 The metal base is powder coated metal or chrome. The bisecting lines of the base create an interesting design feature in the top as does the reflection of the base through the glass. 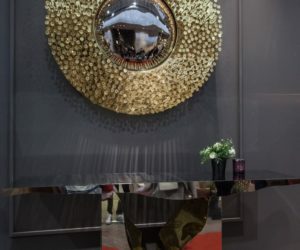 Glitz, glam and some gilded scorpions were among the features that caught our eye at . 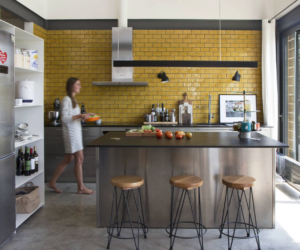 The design house based in Portugal has long been a favorite. 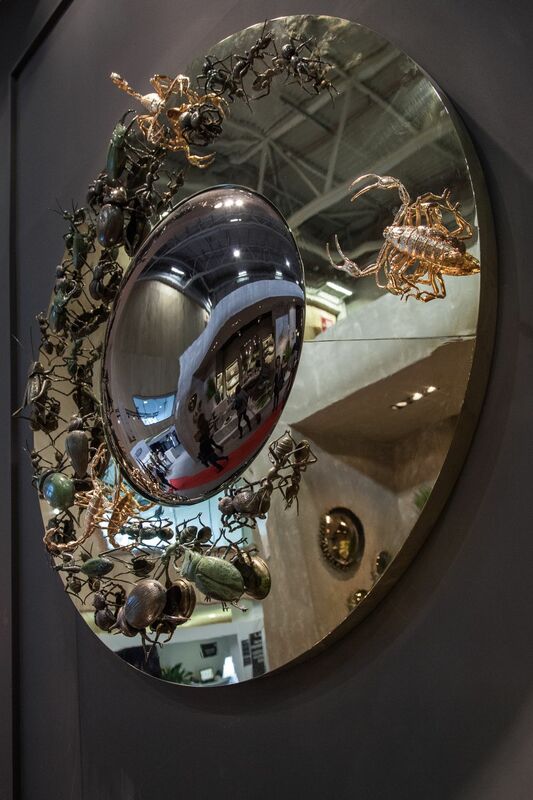 Their mirrors are as much art as they are useful wall piece and the Metamorphosis collection definitely attattentionention with its shiny creatures — scorpions, ants and other insects — all from the darker side of nature. The concave shape of the frame is created through hand-hammering. A profusion of brass nails that have been enhanced with textured heads, all created by hand, form the frame of the . 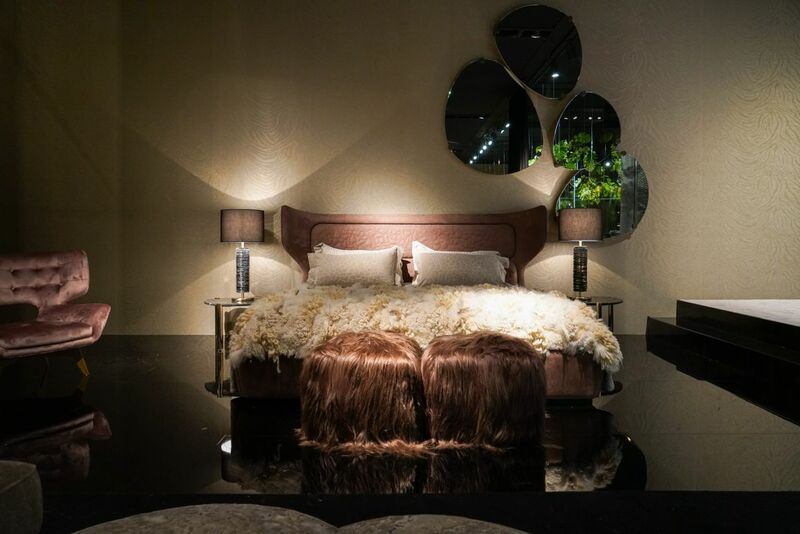 The piece is large, luxurious and imposing, as are many of the company’s mirrored pieces. Here, the mirror sits above the . Although the exterior is dressed in polished brass and stainless steel, the substantial interior is made of mahogany. 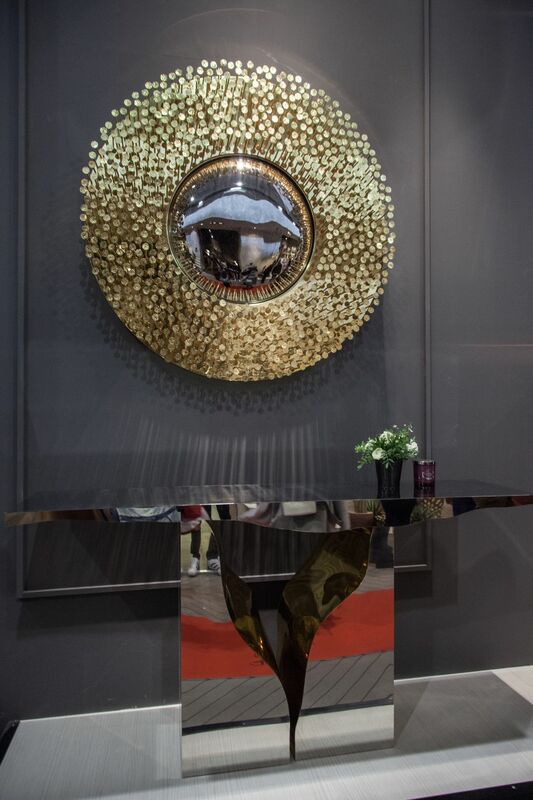 Perfect over a console, sofa or credenza, the mirror will always be a focal point. 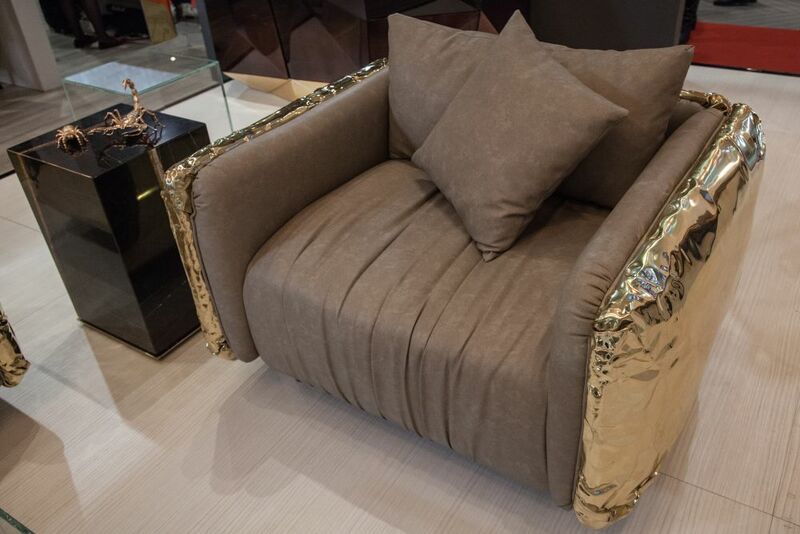 Speaking of gilding, this frame of this chair — which has matching sofa — resembles a Mylar balloon. But in this case, the is an artistic interpretation that celebrates the beauty of imperfection. The piece looks puffy, as if it has been inflated, but when touched, the substantial nature of the work becomes apparent. 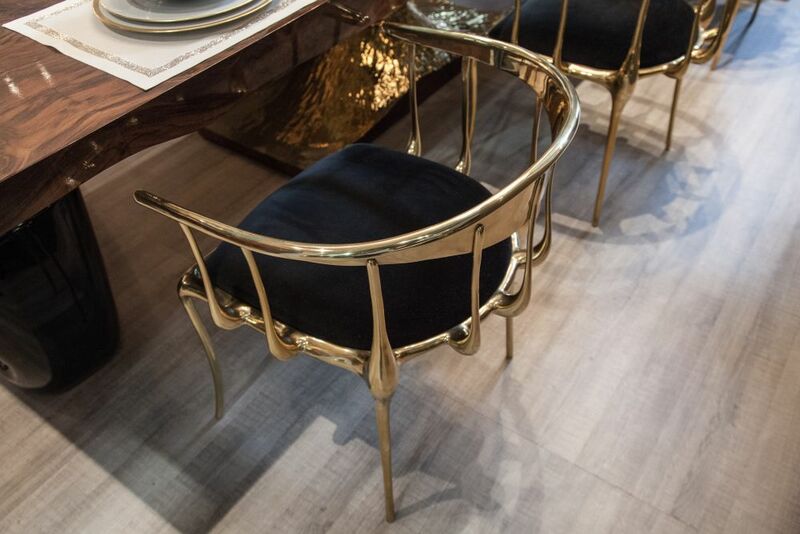 The body of the chair is hammered brass. 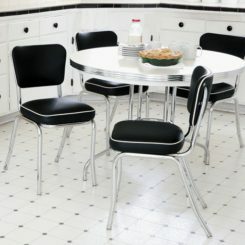 is an elegant option for a dining chair. The brass frame surrounds a h velvet seat. 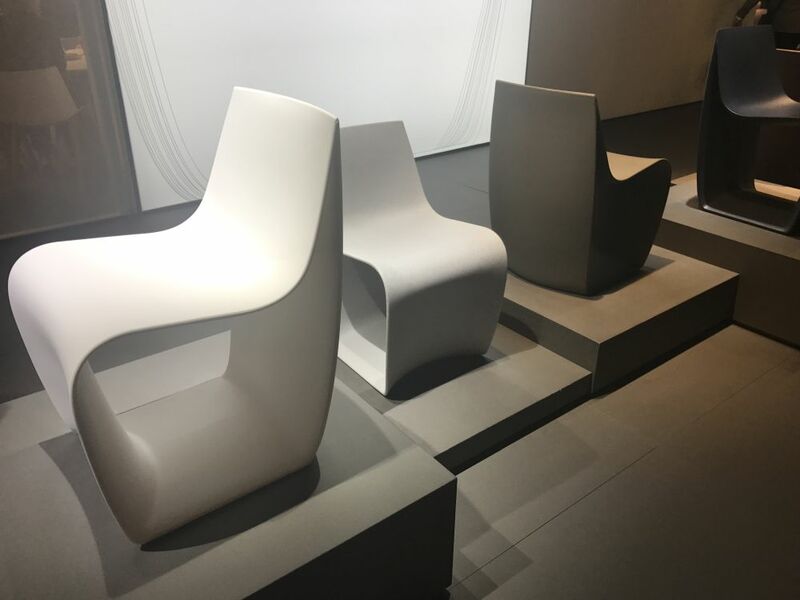 While the basic lines of the chair are straightforward, it still evokes a luxurious feeling because of the curves and the drop-like, bottom heavy rails that support the upper curve. Ii is available in a number of metallic finishes. The piping is more than just an accent — its a critical part of the overall, sophisticated look. The classic look would be at home in any modern living room. The Quindici lounge chair is a minimalist piece in simple, natural wood by of Paris for Mattiazzi. 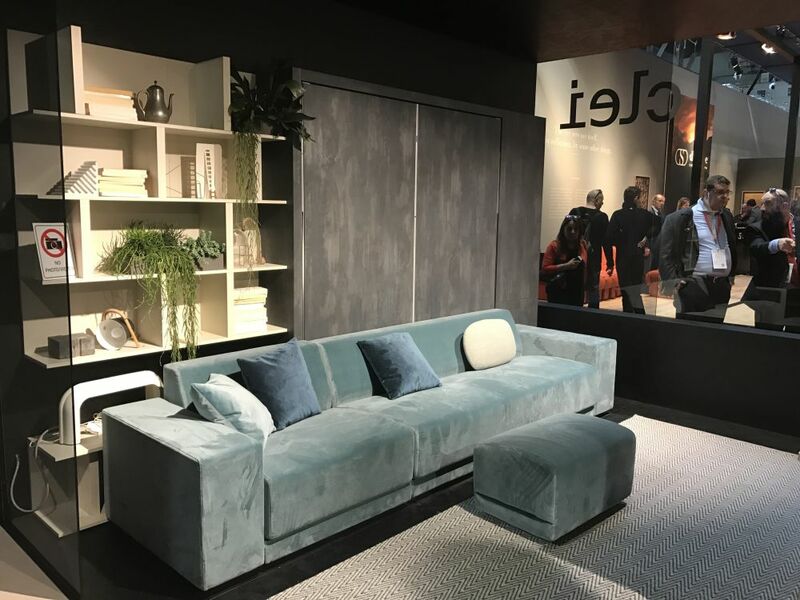 The brothers created this lounge — there is also an armchair version — out of pale ash, however gray and ball finishes are additional options. Several upholstery colors are available, all in Kvadrat materials. In full profile the chair suggests a reclining figure, propped up by the rigidly geometric t-shaped armrests. 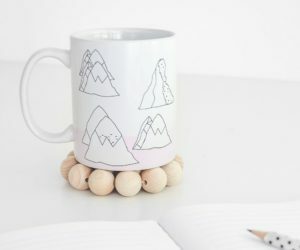 Truly aiece for the minimalist at heart. If you’ve ever wanted to hide away in a comfortable outdoor nest, reading and napping the afternoon away, this Nestrest collection is just the ticket. Curl up among the many pillows and enjoy the outdoors with a good dose of privacy. 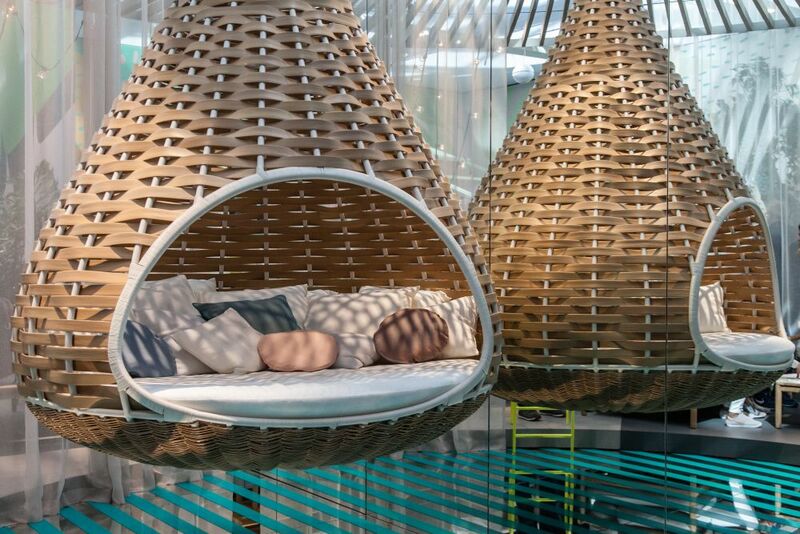 The cocoon of woven fibers comes in white or natural and covers a lightweight but durable frame of aluminium. 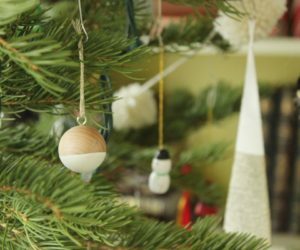 The specially designed rope system lets you hang it from any stable support or a tree branch. This modern dining set was created by Calligaris, a family-owned Italian company that s almost a century old. Ann industry leader in Italy’s “Chair District” in , Caligaris merges the art of handcrafted furniture with industrialization. 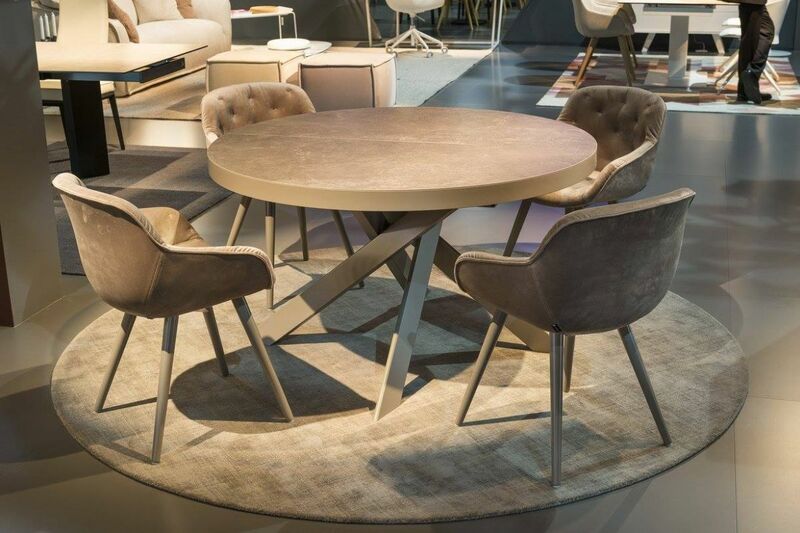 The Tivoli dining table is a compact and function round table. If you need more space it’s not a problem because the table extends into a long oval. The base is made of four V-shaped supports that interlock. Surrounding the table is a set of the . It is an upholstered armchair that’s perfect for the dining room or living room. The spare four legs and pared down body make it versatile but still special because of the tufting in the seat. Choose from wood or ceramic for the round top. Either material can be used for the extending top. 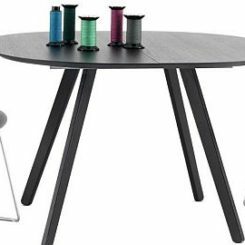 If you need a larger table for a dining room or for entertaining, Calligaris’ is a good choice and It has a pedestal base and an oval top made out of tempered glass. It’s also very easy to extend the two leaves extend by sliding out from under the glass top. Prize-winning Japanese designer showed some interesting pieces. 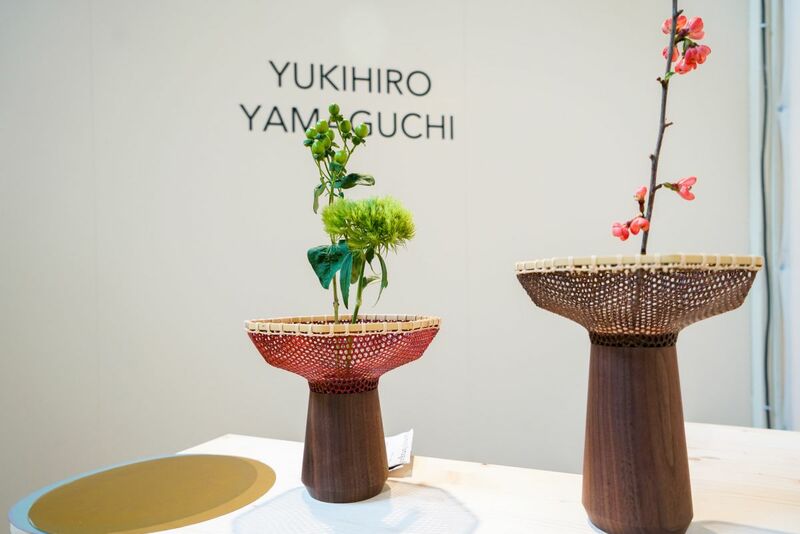 In addition to his unique upholstered chairs, he presented these wood and woven material baskets that are great for showing off you r spring flowers in the traditional Japanese style. That said, they would also be stylish for other uses also. The combination of wood and woven materials is very organic. The Moris Collection by includes 22 different modular pieces of seating. These indoor/outdoor pieces are colorful, airy, fun and verastile. 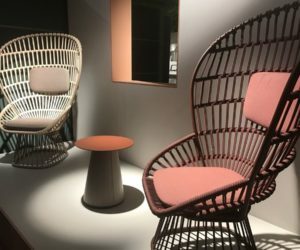 The designer merged two concepts from Mauritius: hand-made Roitin furniture and the weaving of the traditional Tenth baskets. 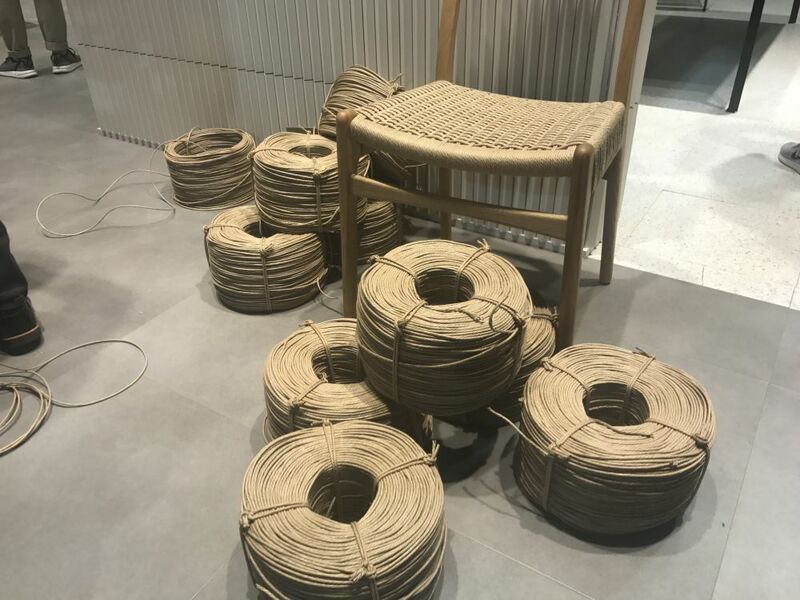 The geometrically shaped seats are made from iron and plastic or maritime rope for durability. “Moris” means Mauritius in the Mauritian Creole language. is perfect for today’s connected lifestyle. It has a built-in Bose 2.1 system with an integrated subwoofer under the seating area. 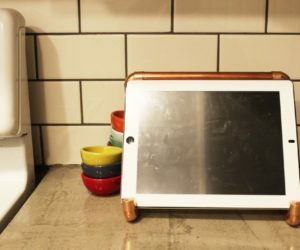 Speakers are in the upper front part of the chair, creating a system you can connect to your phone, tablet or laptop using Bluetooth or Apple AirPlay. 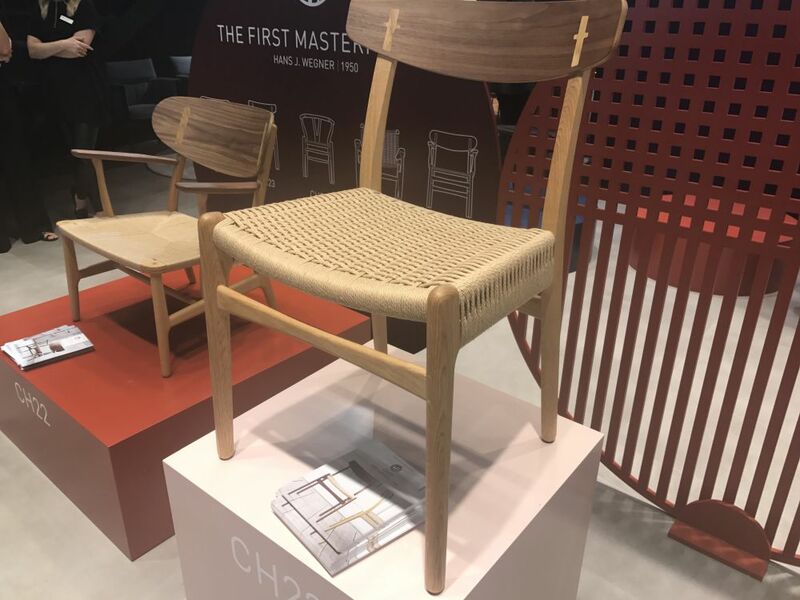 The chair has a plywood interior and the cushioning is made from foam of three different densities for optimal comfort and sound. 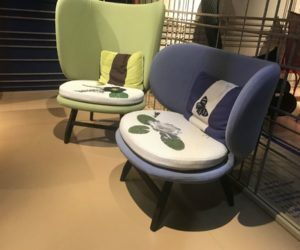 The Slovenian company also makes a Beatnik Communication Chair that has a built-in iPad mount that allows for hands-free phone calling with privacy inside the cocoon. 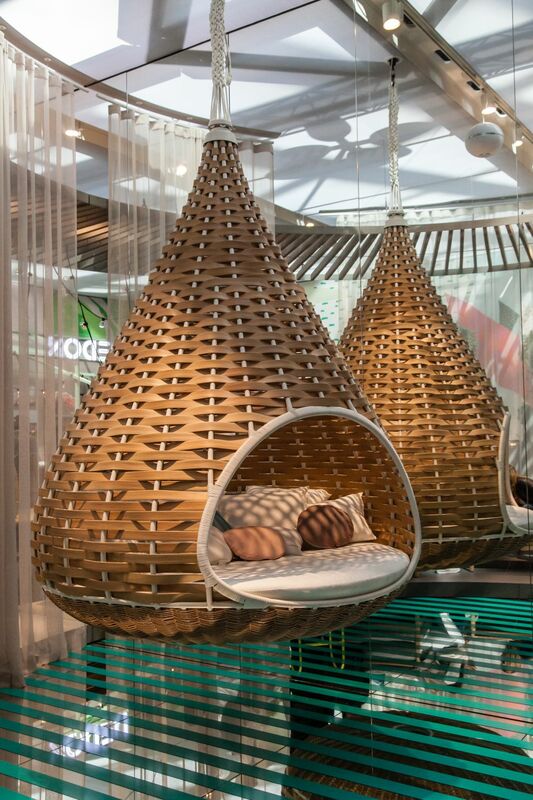 The cocoon-like shape is the perfect listening environment. Stylish construction conceals the technology. 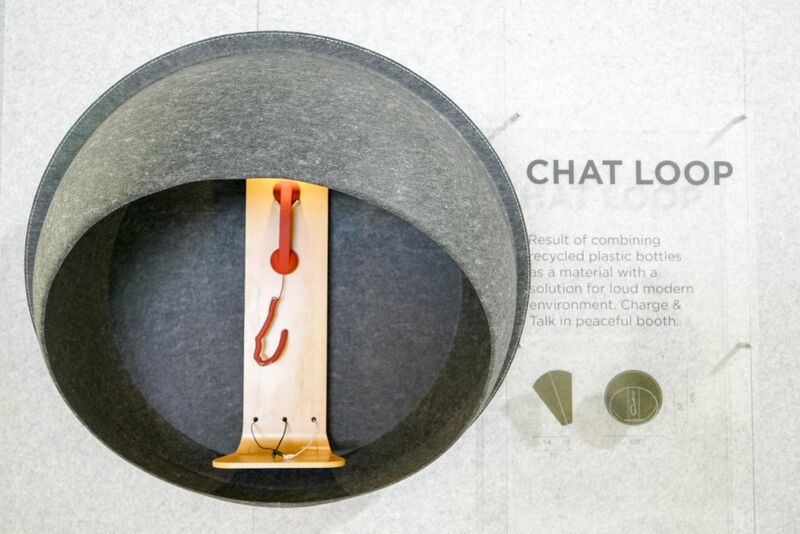 Donar also created to create a sense of privacy for those who need to make a loud phone call. 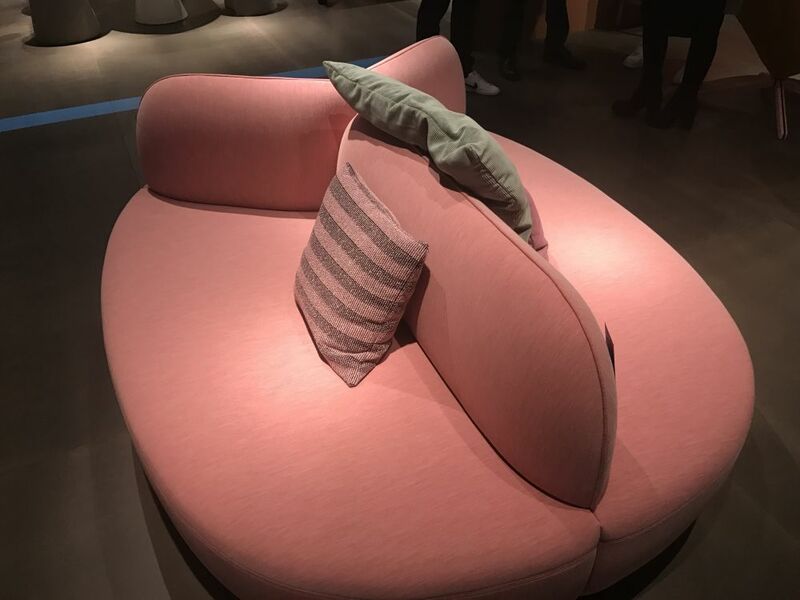 Perhaps even more importantly, the seat provides a barrier between the outside world and the person having the call inside — saving a great deal of annoyance for those in the general vicinity. 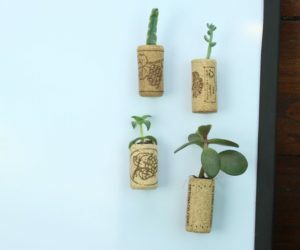 The designer, , aimed to upcycle materials that were destined to be trash and used felt made from recycled plastic bottles. 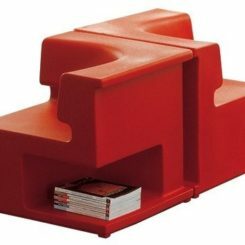 The Chat Loop includes a curves shelf to make it easier to take notes or provide a spot for you to place your phone or tablet. This is perfect for keeping phone conversations private in a public space. Zesty is available in birch, stained or lacquered versions, in walnut or European oak. It may look funny but it will definitely do your body good. The Balance Seat can help you fight back pain by forcing you to sit with you pelvis rotated properly and achieve better posture. It’s a Finnish invention that emphasizes ergonomics. In addition, shifting in the seat makes you engage your core and work the abdominal muscles. It’s also great for cutting down your rehabilitation time from injury, whether you are young or old. This looks a bit like a giant bicycle seat. No matter where your office is located there are times when you could use a private place for a discussion or meeting. 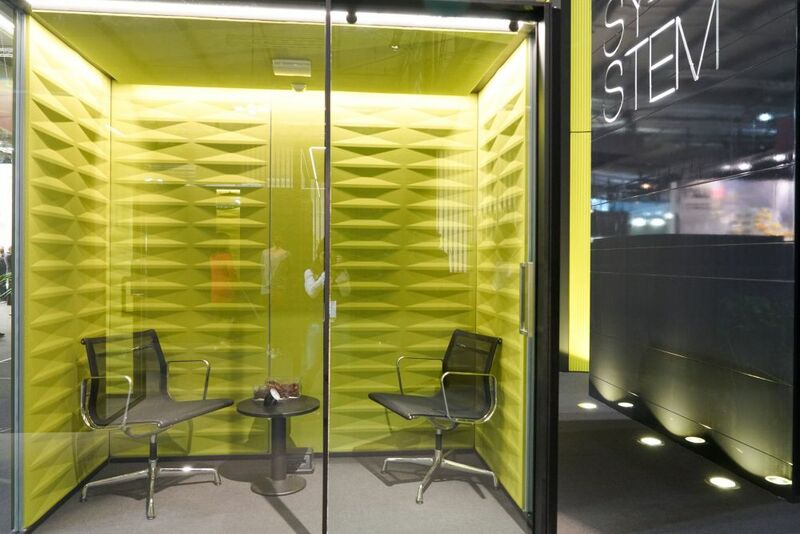 is a system of partitions that you can use anywhere to correct acoustics and absorb sound. The company’s modular element are independent and free standing, which means no construction is necessary. Need a room for private meetings? 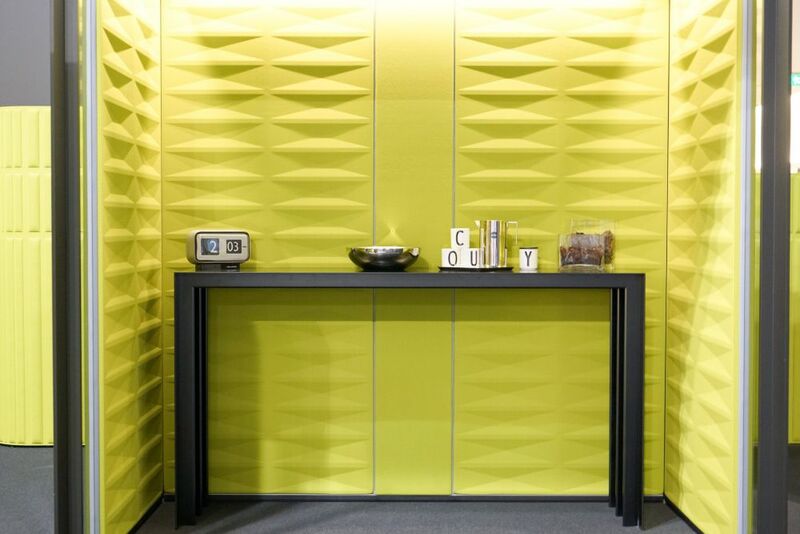 Here’s one with a glass wall and sound-absorbing panels in a bright color. If you don’t need to close it off completely, leave one side open and place some furniture inside. Uplightinging can be a good choice when you don’t need a lot of direct work light. 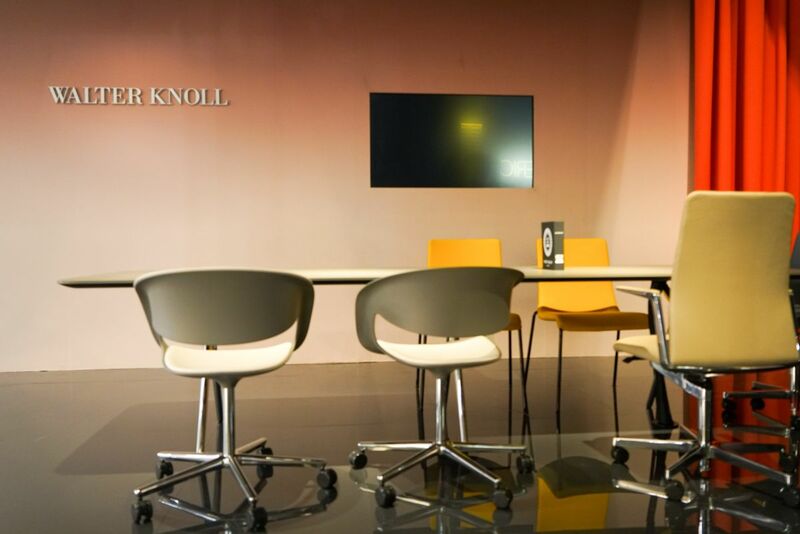 The Knoll family has been crafting products since 1865, when it started as a leather business in Germany. 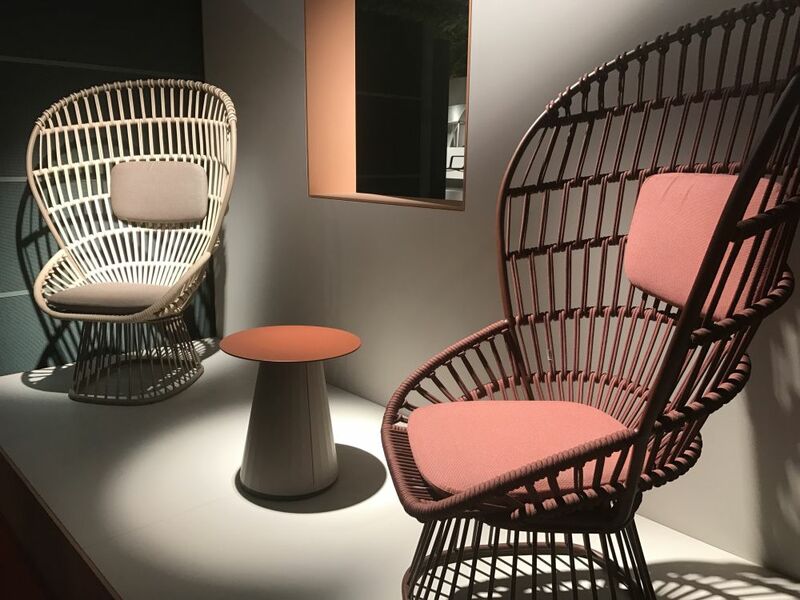 It has evolved into a firm that creates classic pieces and new icons like these chairs — the on the right and the Lox on the left. The Lox is versatile and can be used as an office, dining or lounging chair. 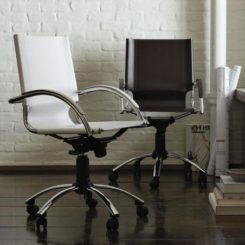 It’s minimalist as well as comfortable and the pads can be upholstered in leather or fabric. Casters and fully swiveling base add to the functionality. 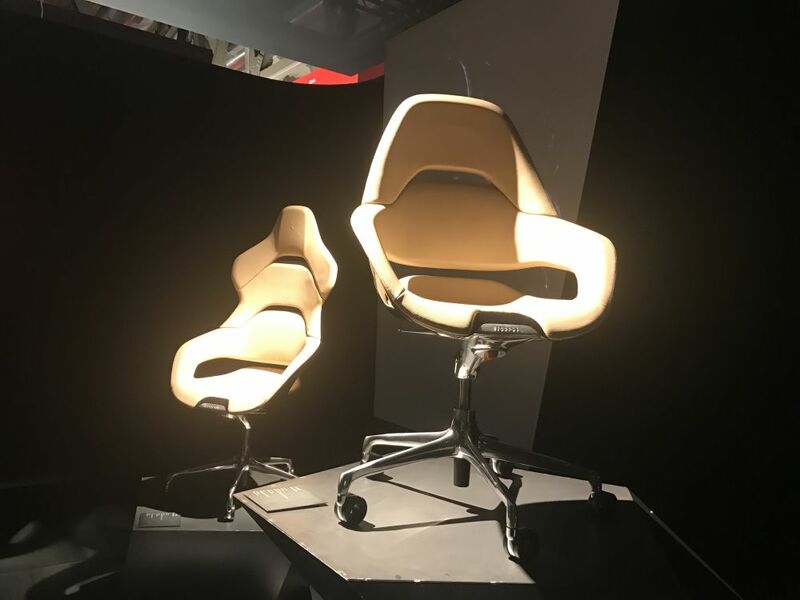 A smooth leather back and a modern lifted front distinguish the Leadchair Executive. 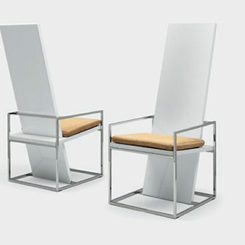 It took Knoll five years to develop the piece, which features elegant lines and a commanding presence. 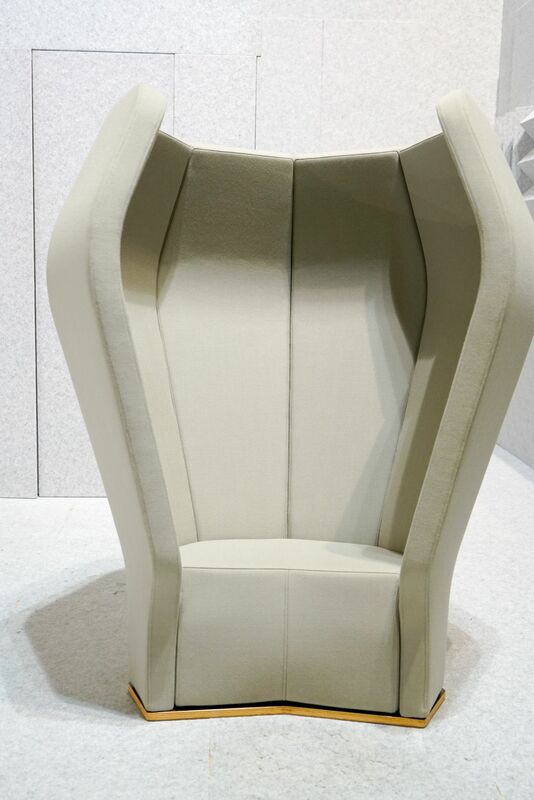 Geometric tufting keeps this chair all about business. It is available with or without arms and a headrest. 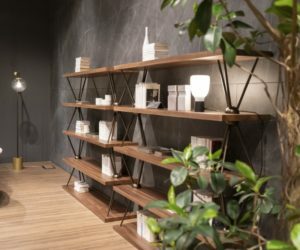 In the Euroluce section of Salone, we were quite drawn to My Lamp Suspension Rectangular. 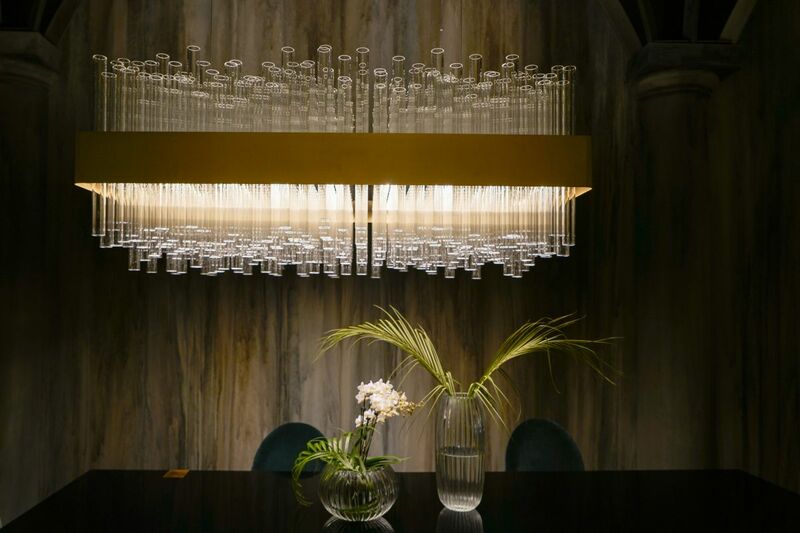 The fixture is an intriguing combination of simplicity and complexity: The mass of Venetian borosilicate glass tubes forms a fixture of complex design when grouped. The metal band that binds them together has a special galvanized finish. Castelli’s Venus is another lighting style that highlights Italian glass. 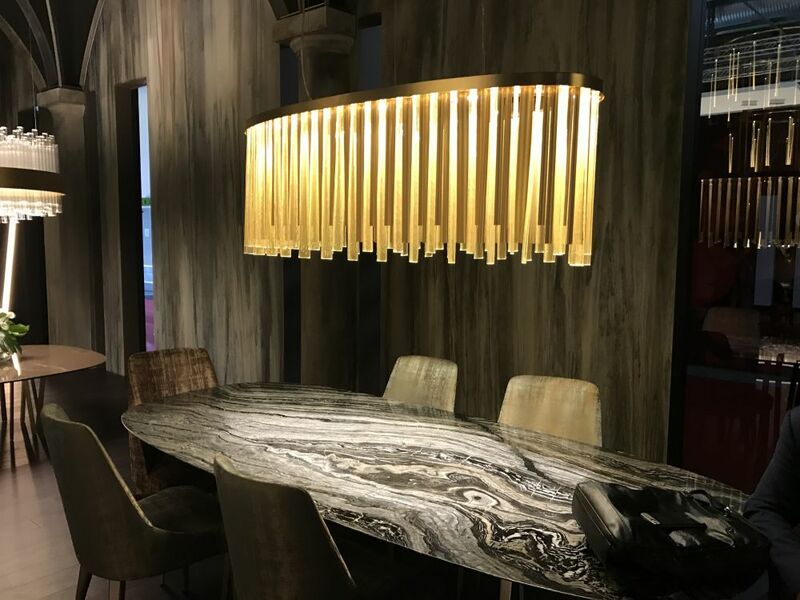 The dramatic fixture features slats of Murano glass that contain 24 karat gold flakes. 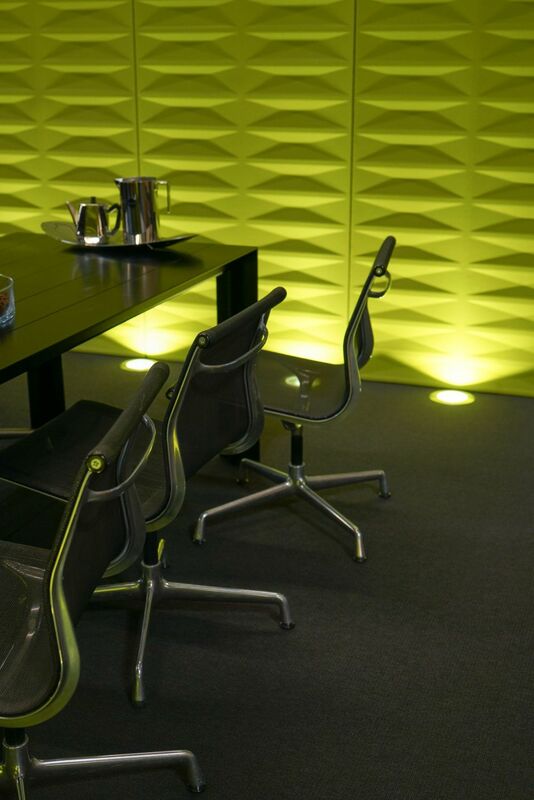 The staggered lengths of give it a textural feel and contribute to the quality of light emitted. Both the smaller round fixture and the large oval chandelier are spectacular. The Flora table features natural pink fusion fire stone atop a woven metal base. Venus hangs over the oval For Hall Table. 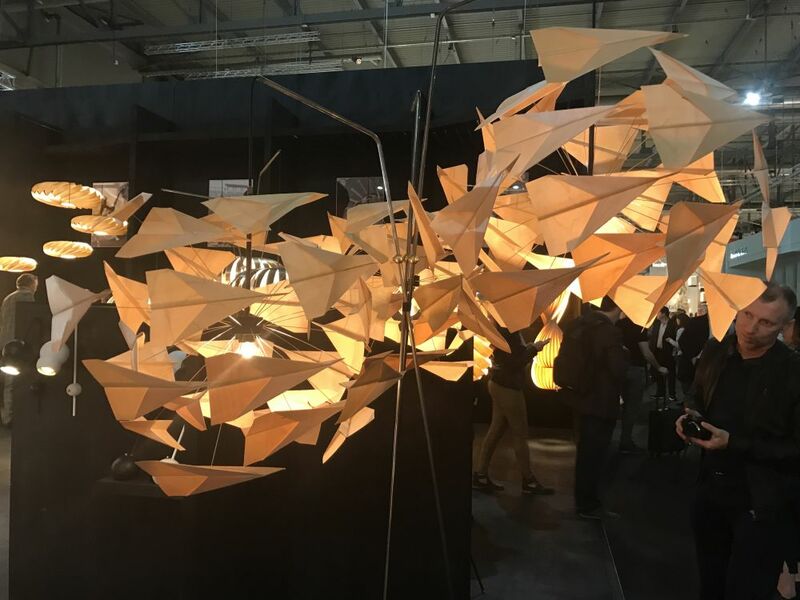 Tom Rossau’s is also called “Come Fly With Me.” Comprised of 32 hand-folded birchwood planes, it forms a fixture of light and movement. Rossau likes to maintain an element of play in his designs, which echo the Scandinavian design traditions of wooden lighting. The Danish designer’s work uses natural wooden veneer in his sculptural lighting diffusers. These planes come together in a contemporary Danish lighting fixture. The light evokes childhood memories of making and flying paper airplanes. 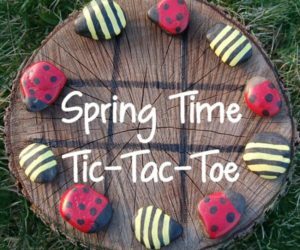 The element of fun is what makes the design different. 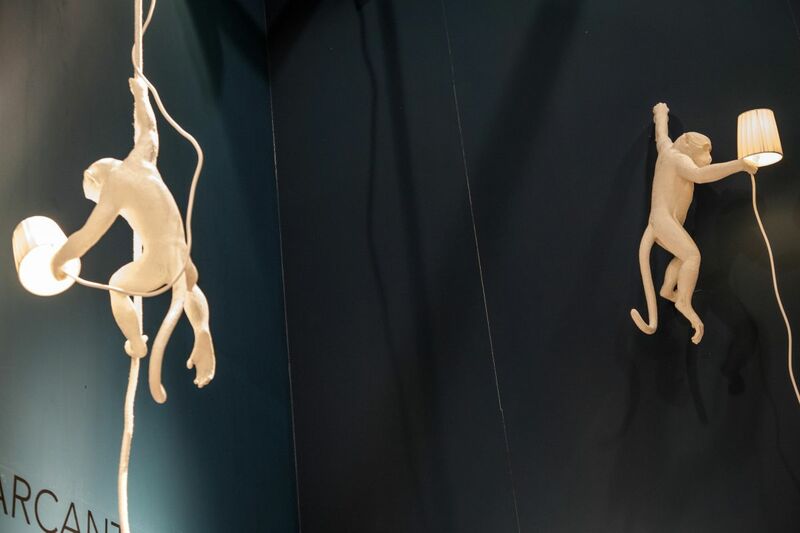 Now this is the definition of whimsy – monkeys hanging form the ceiling and the walls, holding your lights. The from Seletti. The playful collection includes seated primates that are good for the floor or a table top as well as the hanging versions. Best of all, none of them require wiring and are set to hang, plug in and turn on. Stately and colorful, Lladro’s magnificent is made entirely of porcelain. Known for its luxury a hand-crafted porcelain, this piece is an aficionado’s dream come true. 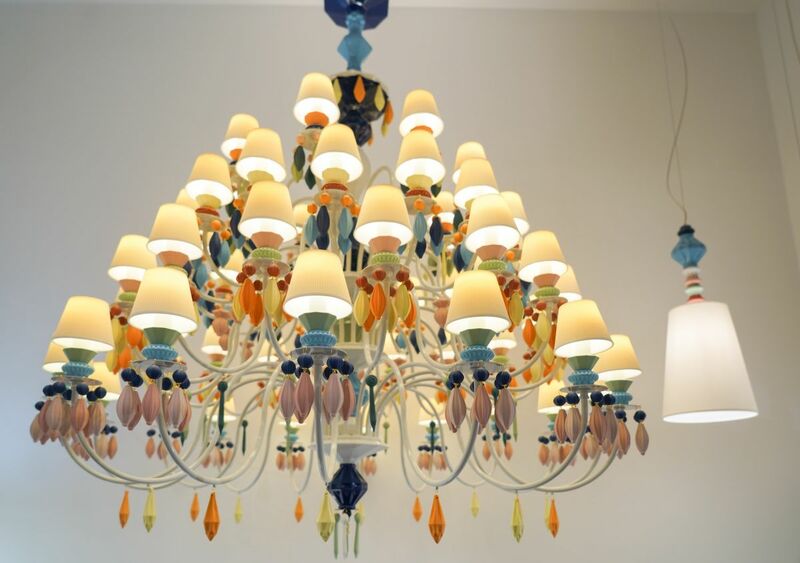 The classic chandelier shape is reinterpreted to best feature the porcelain work. It is available in three size versions as well as this and black color options. 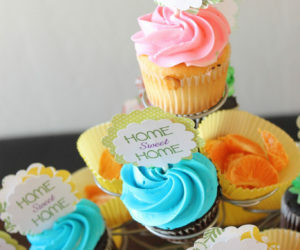 This colorful style is fun and casual. Founded in 1920 is built on a passion for beautiful things. 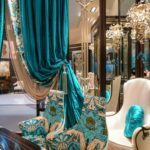 Passed down through the generations, this talent of sculpting and creating magnificent traditional designs is now the basis for this global business that produces furniture for every room of the house. 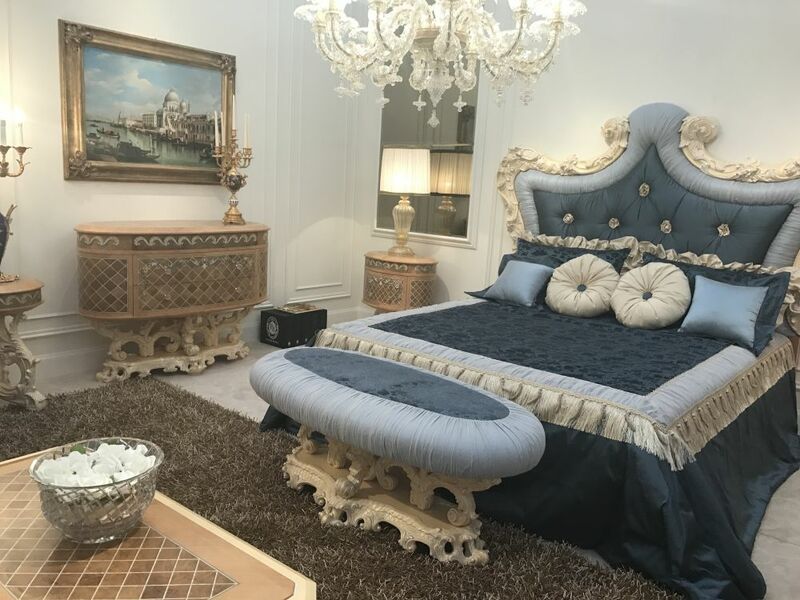 In this spectacular bedroom set, the ornately carved dresser, nightstand and bench base pair perfectly with the headboard of the blue bed. The curved outline of the headboard, carved accent detail and deeply tufted upholstery emphasize the room’s luxury feel. Pale colors are serene and sophisticated. Even a truly top-of-the-line living room can have a television when it it is luxuriously frames as this one is. the light color of the wood furnishings keep it from becoming too formal. Flanked by two tall cabinets, the media center becomes a serious piece of furniture instead of an add-on. Beautiful occasional tables and a deeply tufted ottoman complete the look. This shows how it is possible to be less formal and still luxurious. 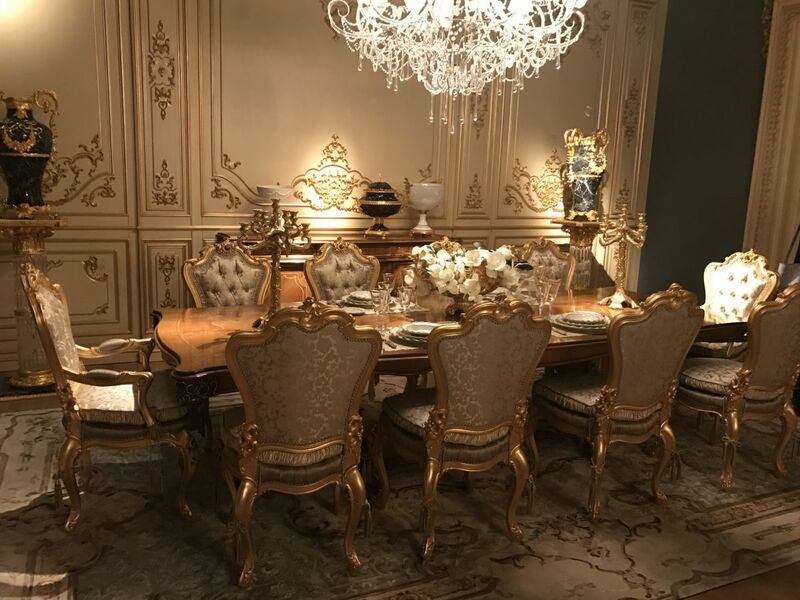 This dining room is the epitome of opulence. 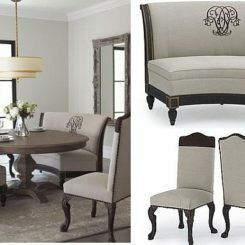 Ornate glided chairs are upholstered in rich damask fabric in a sophisticated neutral tone and surround a substantial table. They also pair well with the paneled walls that have gilded accents. And, of course, it is finished off with a very special chandelier, as any dining room should be. 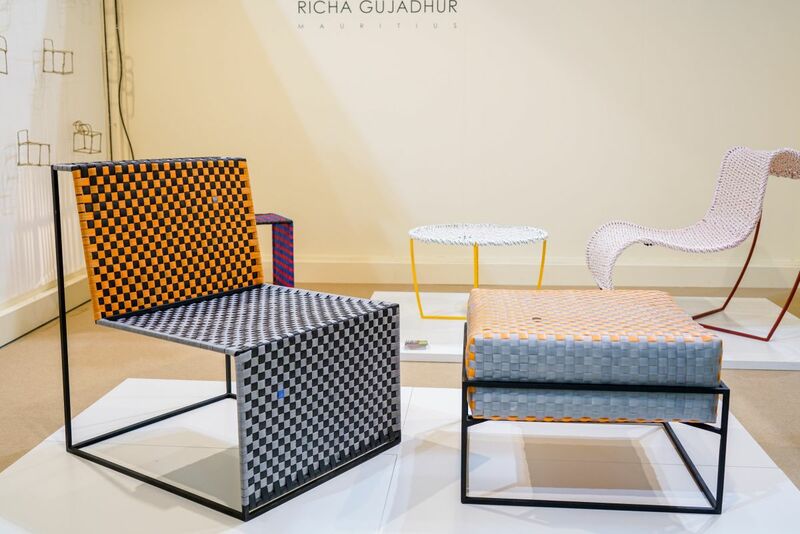 The entire set sits atop a rug that mimics some of the shapes in the room. 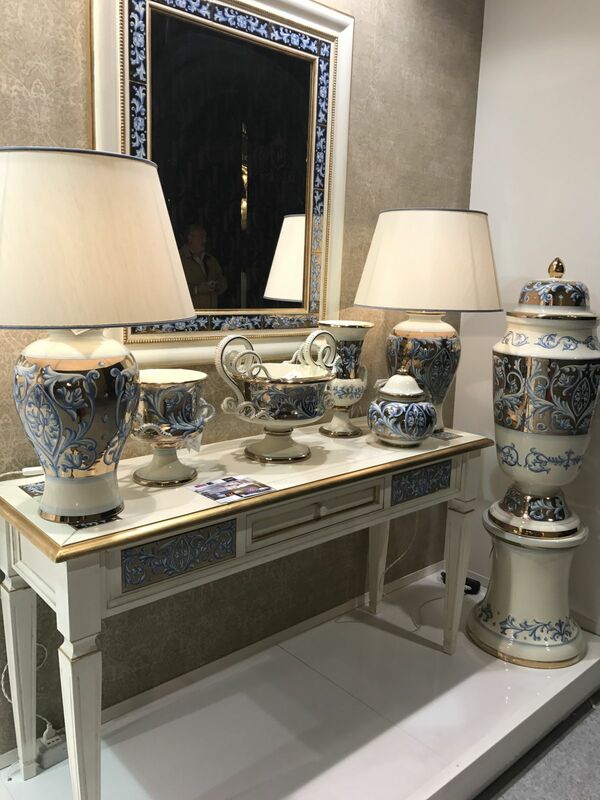 Adding extravagant accessories can really change the look of a space and these blue painted lamps and vessels are good examples. The delicate designs and gold accents highlight the curves of the pieces. Used alone or in a group, they add a special touch. The same blue design is used on the front of the console table. 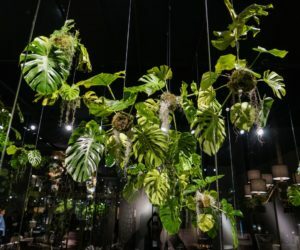 Walking into the stand for was like entering a luxurious jungle of tropical plants, extravagant furnishings and sumptuous textiles. 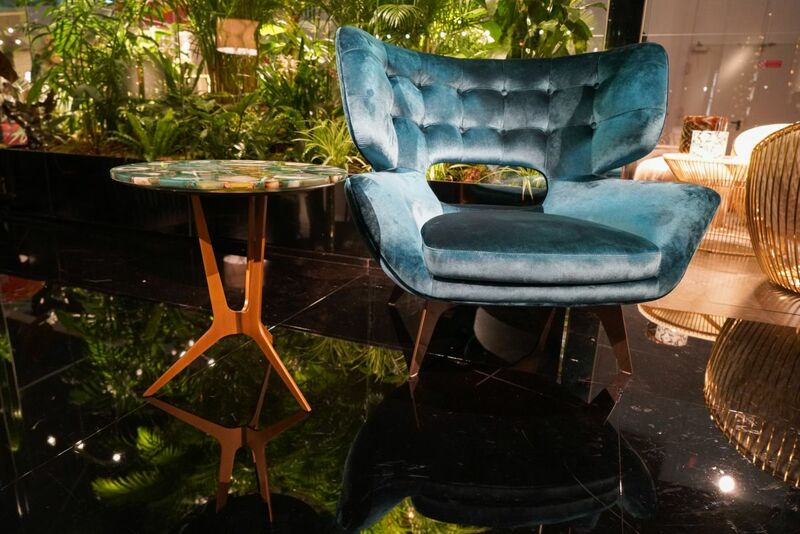 The deep jungle theme played well with the jewel tones of velvet chairs and colorful agate table tops. The displays are also a prime example of the palpable luxury trend that is very evident in the current market. Natural wood makes a good choice for the legs of the table and chair. The same generously tufted chair back is rendered in a trendy blush tone would easily mix with other furnishings in any space. 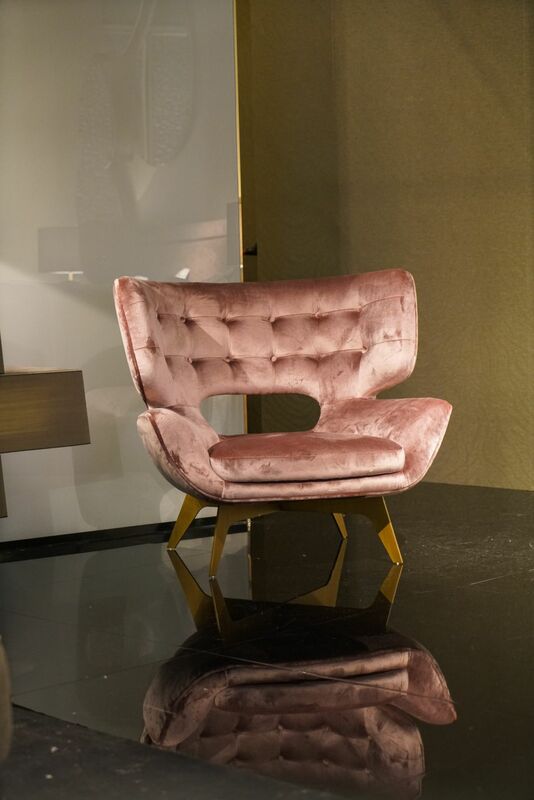 The Maclaine Armchair has a 50s style, in dusty rose velvet. Repeated in an upholstered bed, the rose hue anchors a very textural bed covering. The ottomans at the end of the bed are covered in an extra-long-haired fur that drapes to the floor. The spare decor around the bed allows the texture and colors to take center stage. The rose hue is very trendy current and considered a neutral. A distinctive dresser with a deconstructed look, grand rug, and uniquely textured sofa complete the bedroom setting. Giving the rest of the room a neutral palette is key. 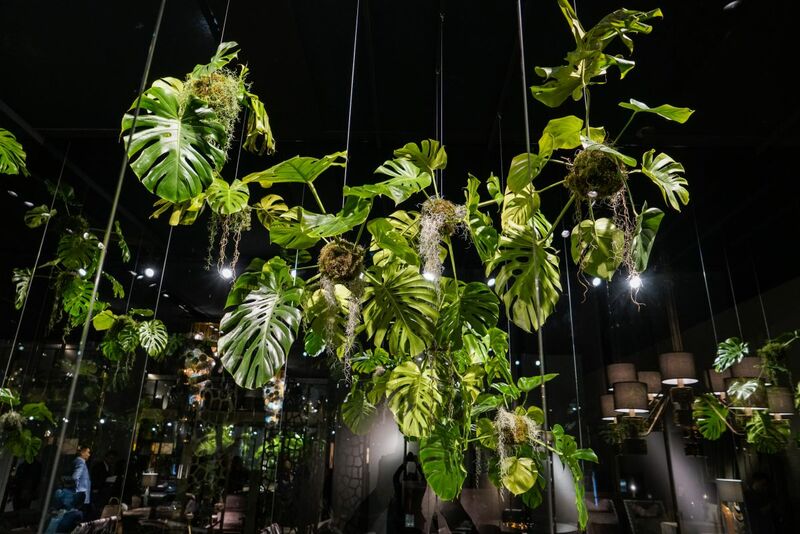 Stylish outdoor seating is part of the Cavalli Collection, and this display really transports visitors into the outdoor environment with the suspended plants. Large tropical leaves hanging overhead emphasize the jungle feel. Pink furniture is a contrast to the greenery. This is a great idea for making any space feel more tropical. Hanging the plants from the ceiling created an entirely different ambiance that just placing them on the floor or on tables. It just invites people to lay back on the posh lounges and relax, looking up at the suspended forest. 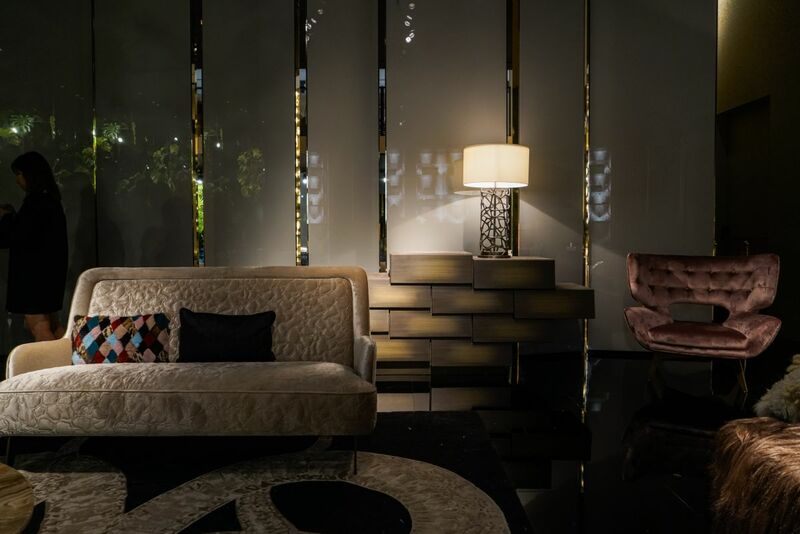 Gilded lounges padded with leather will appeal to those who want a lavish look to follow to the outdoors. 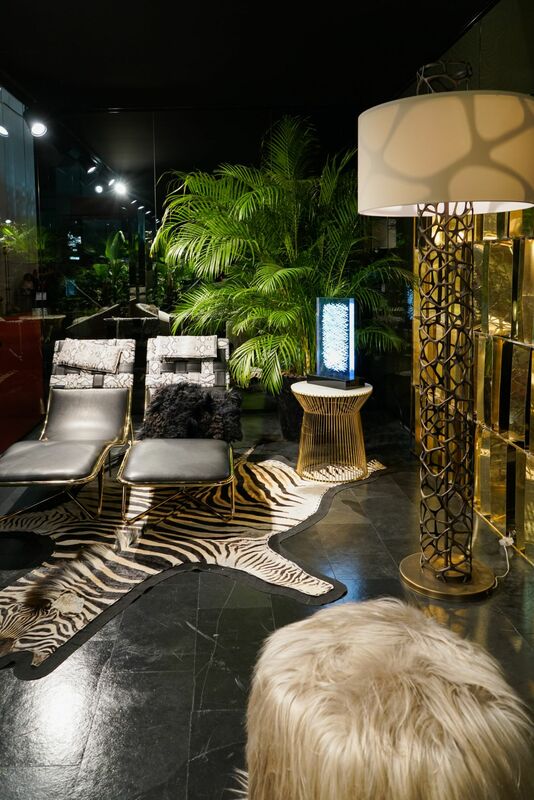 Paired with other gold accessories and an animal hair rug, the setting has an exotic feel, reminiscent of an African journey — even if it’s only as far away as your covered patio or balcony. Long-haired ottomans add to the luxe feeling. 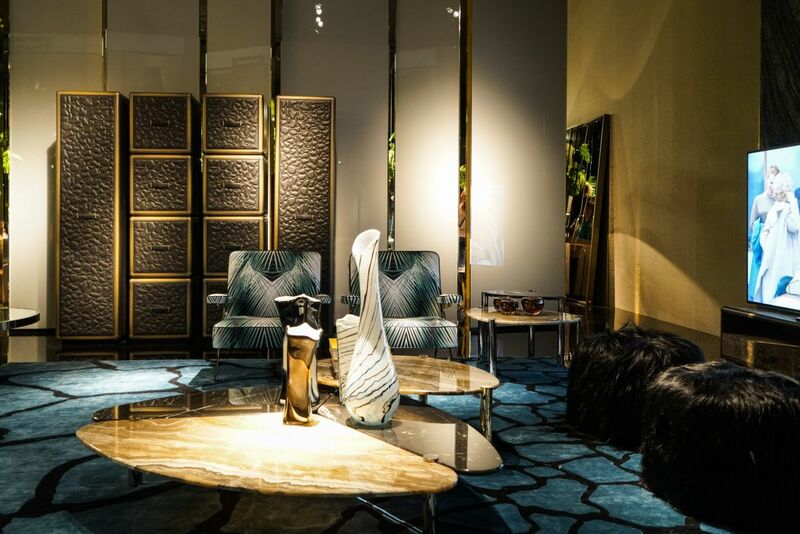 Some of the most stunning interiors come from mixing unexpected items together, as in this Cavalli living room. A boldly colored rug serves as the anchor for chairs that have a tropical print, a coffee table grouping with a high shine and a pebble-textured cabinet. 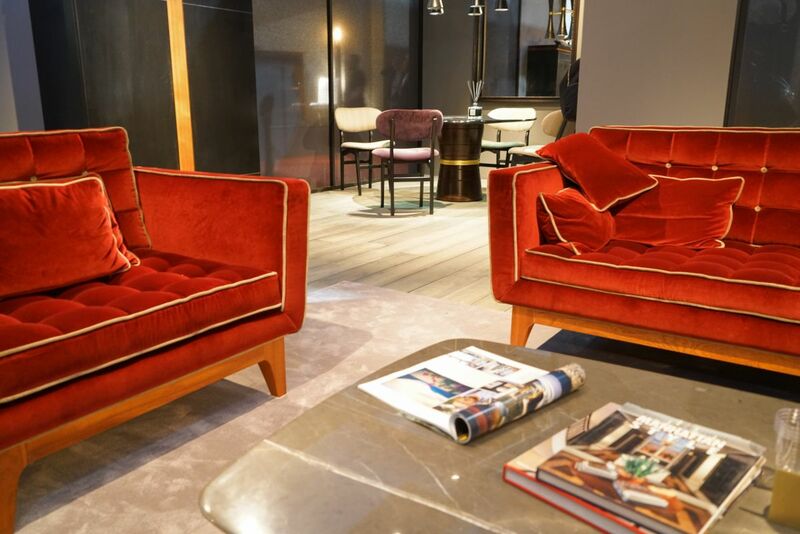 Again, the unusually long-haired ottomans bring a small touch of funk to the luxe setting. 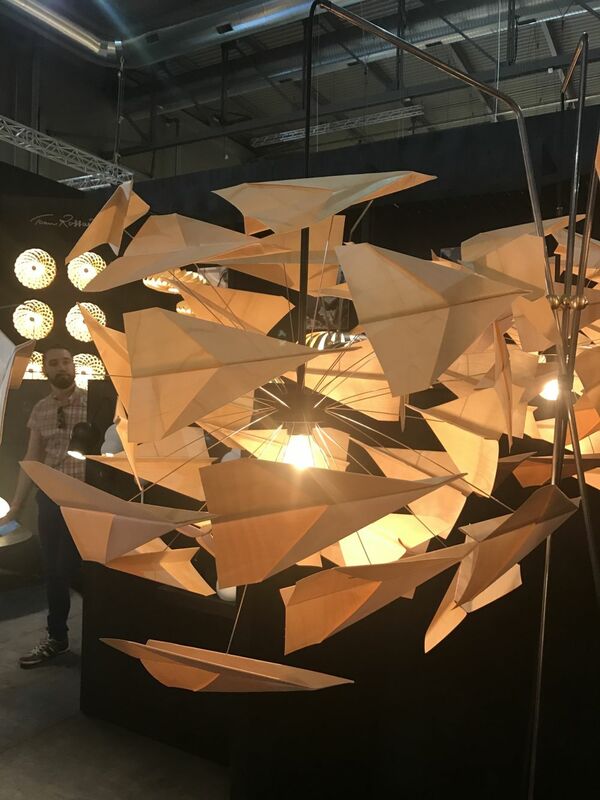 These are just some of our picks from Salone del Mobile 2017. As always, there was so much to see that we’ll be bringing you plenty more new home innovations in the coming weeks. Наша организация предлагает купить махровое полотенце недорого с доставкой.